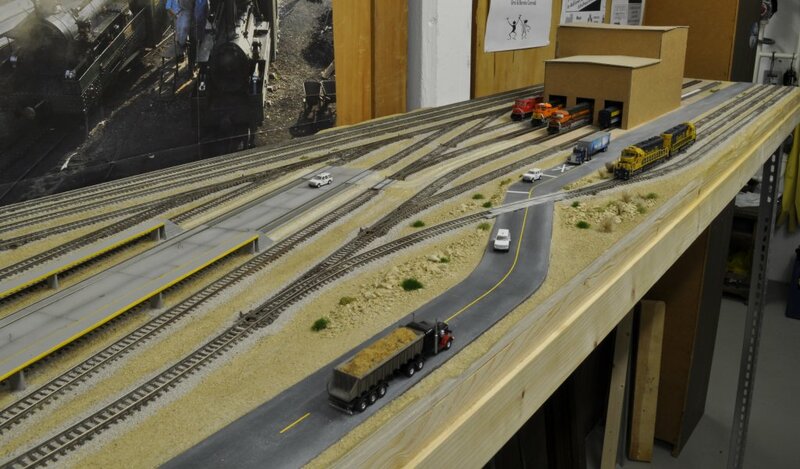 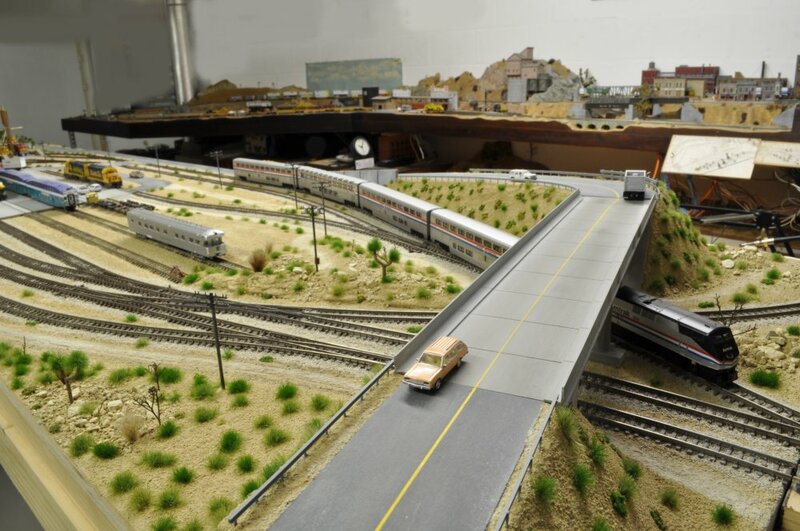 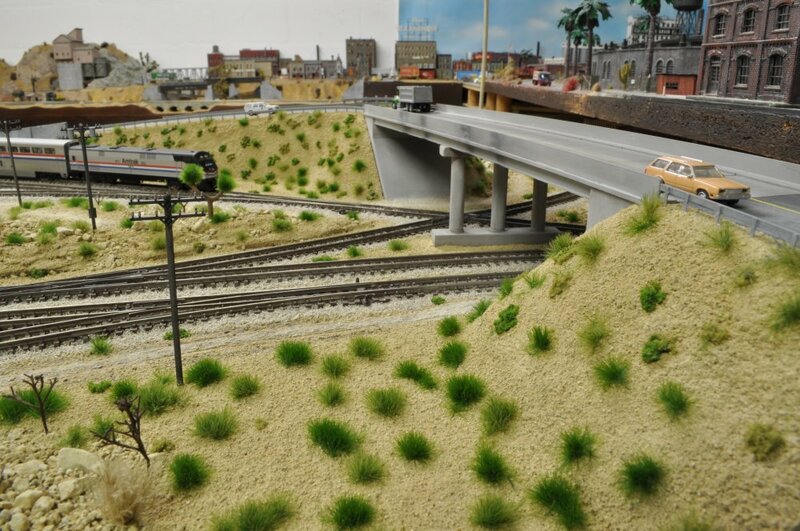 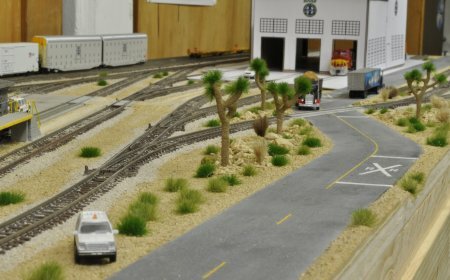 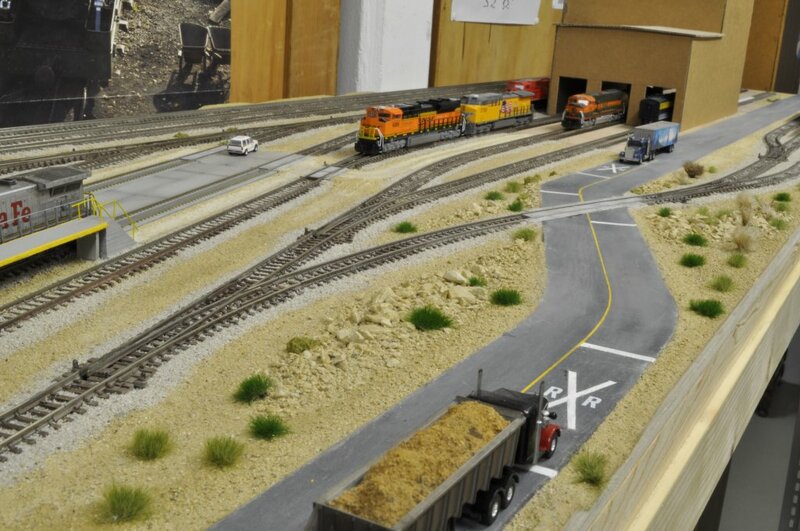 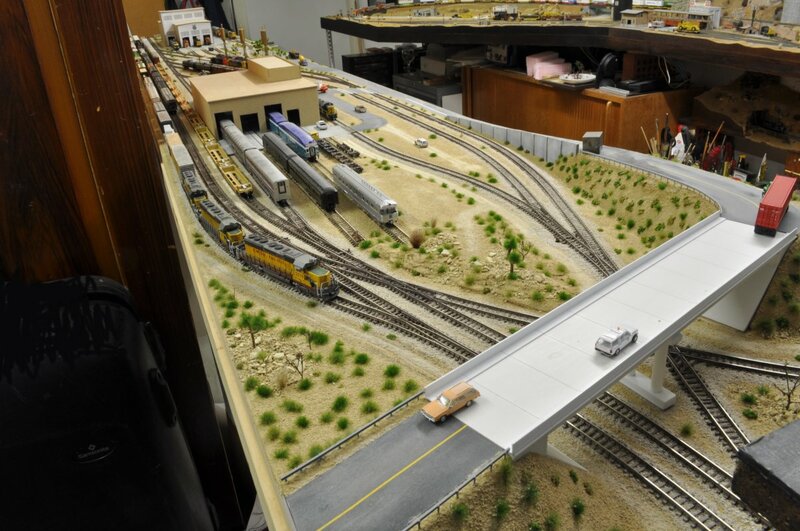 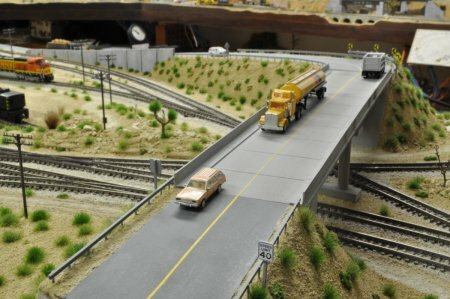 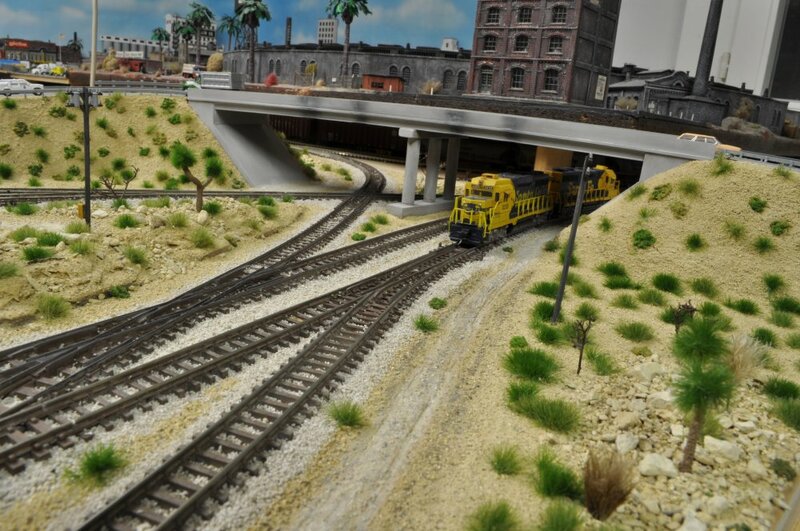 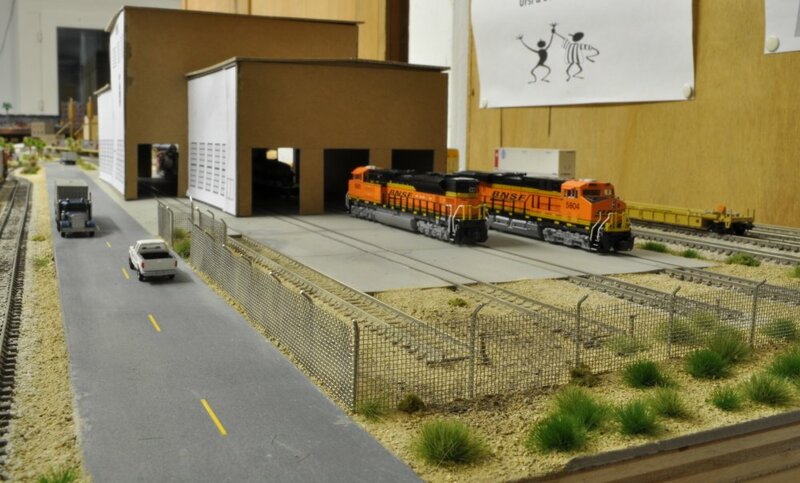 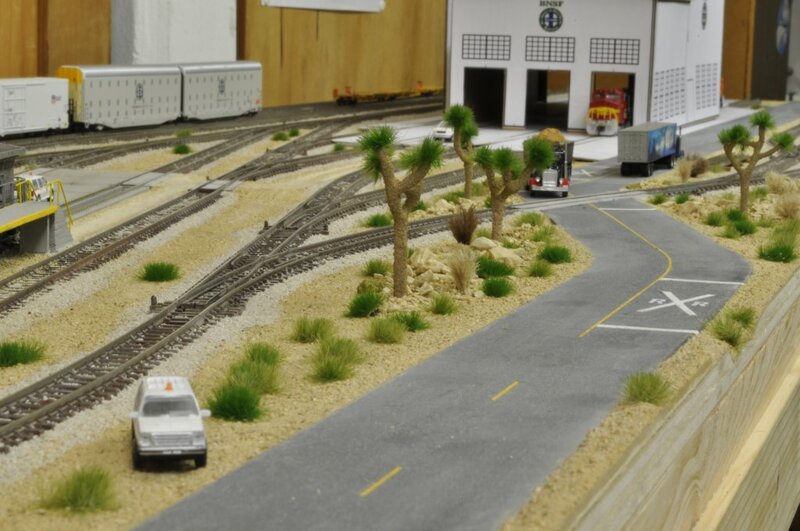 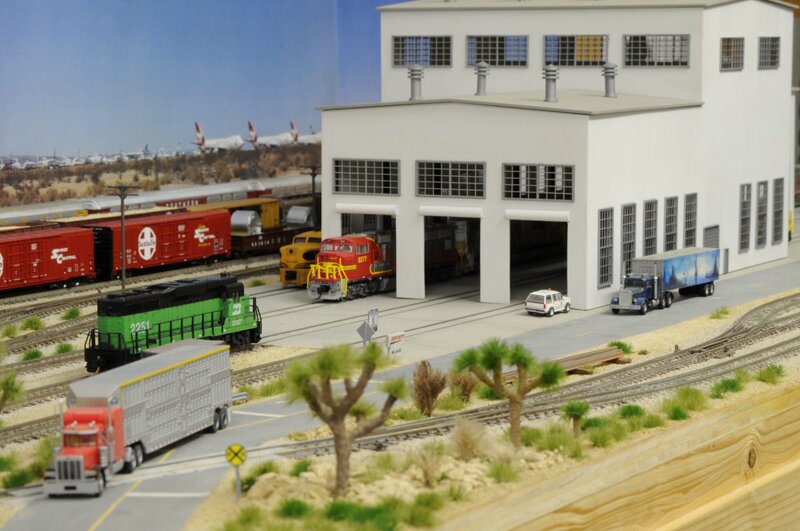 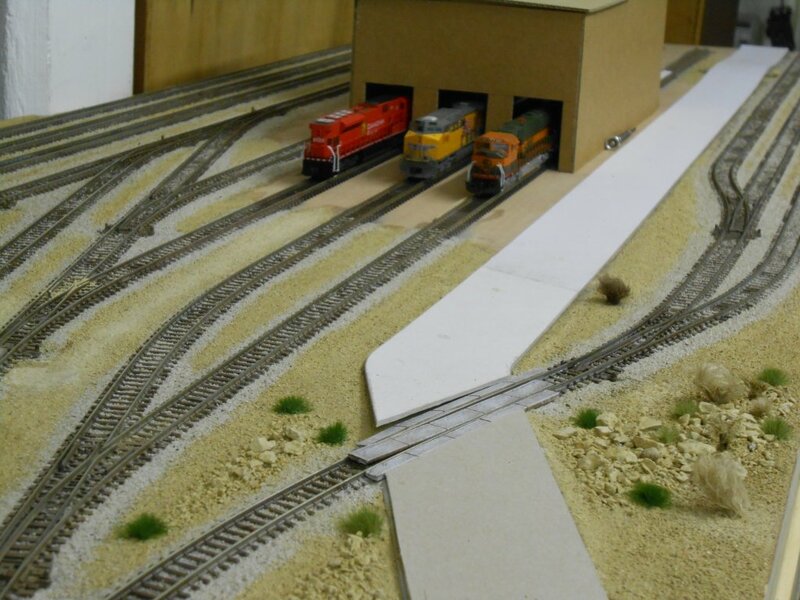 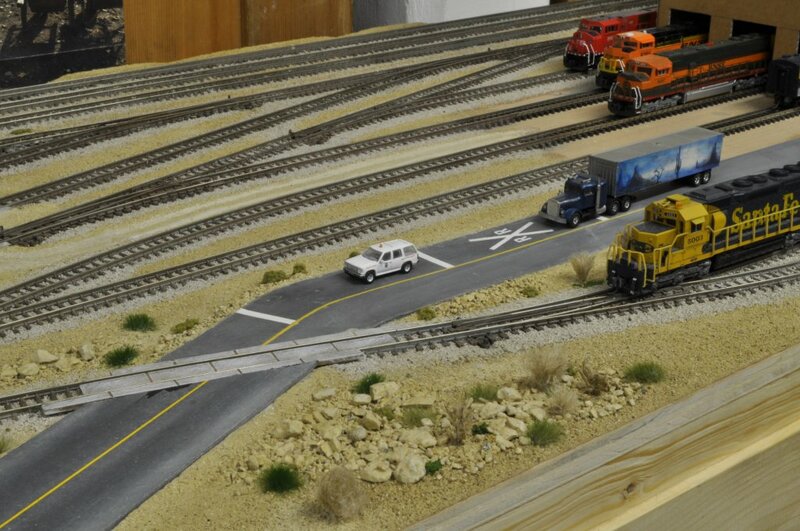 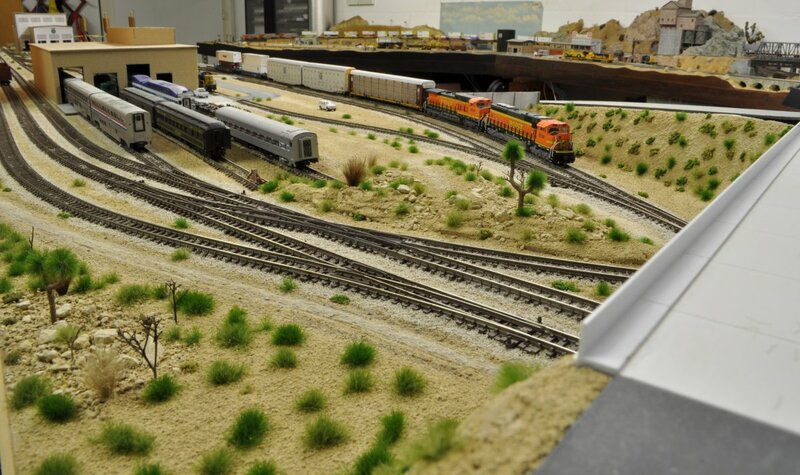 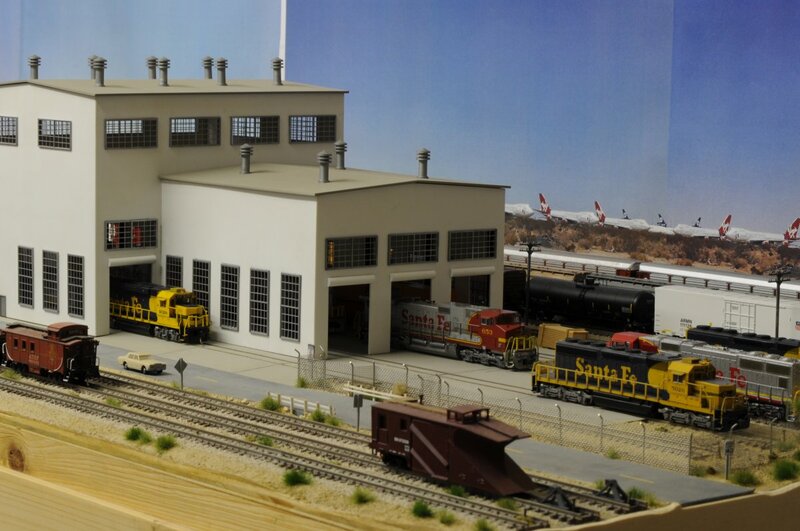 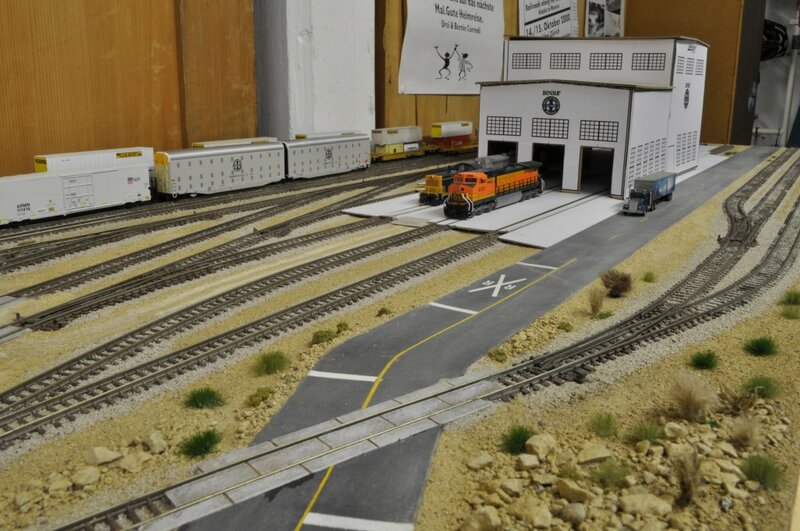 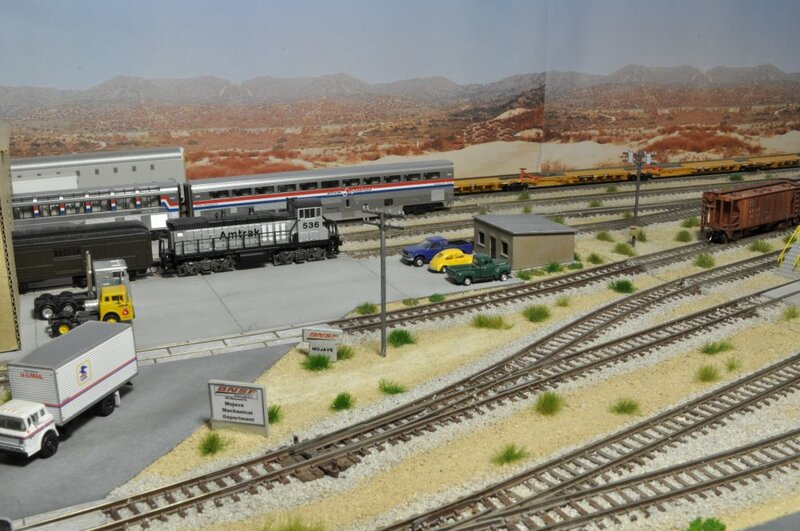 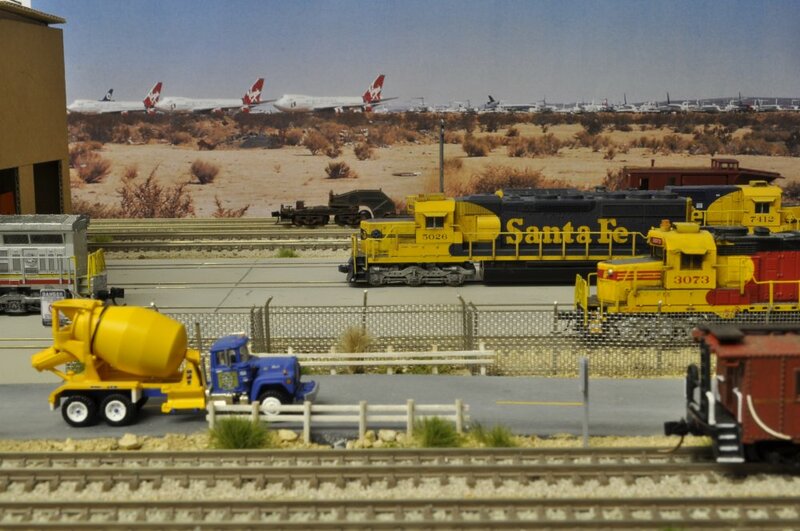 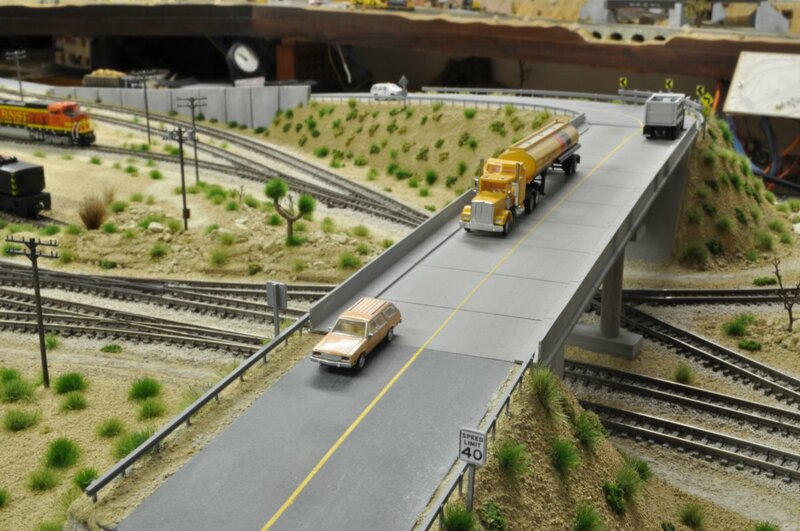 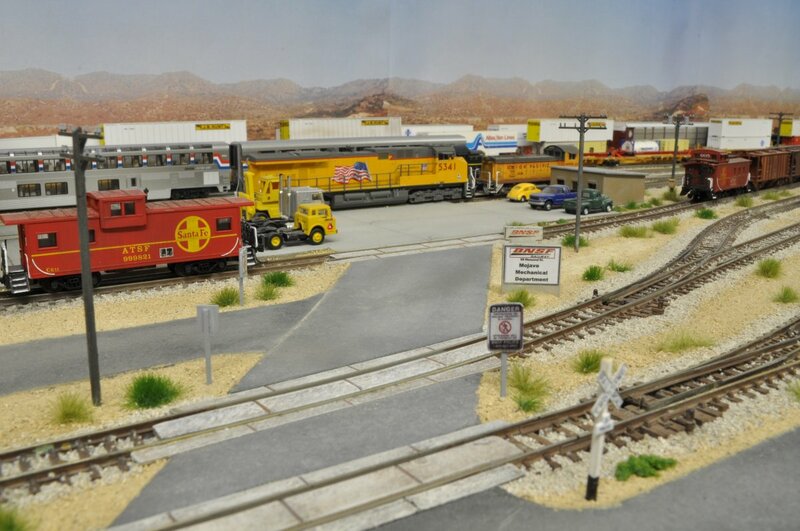 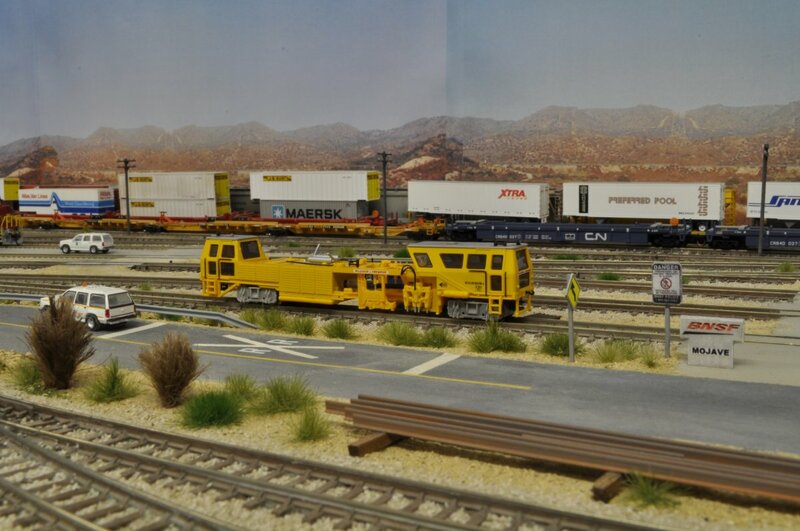 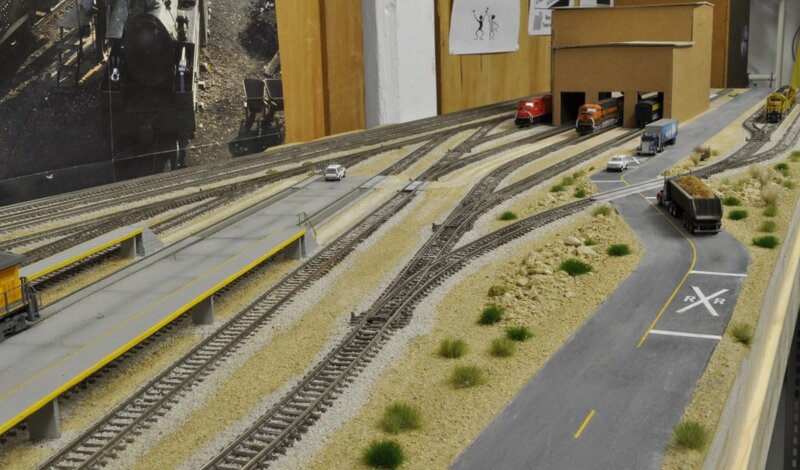 This new "Mojave Terminal" is actually an extension of his existing "Old Part of Los Angeles II" layout. 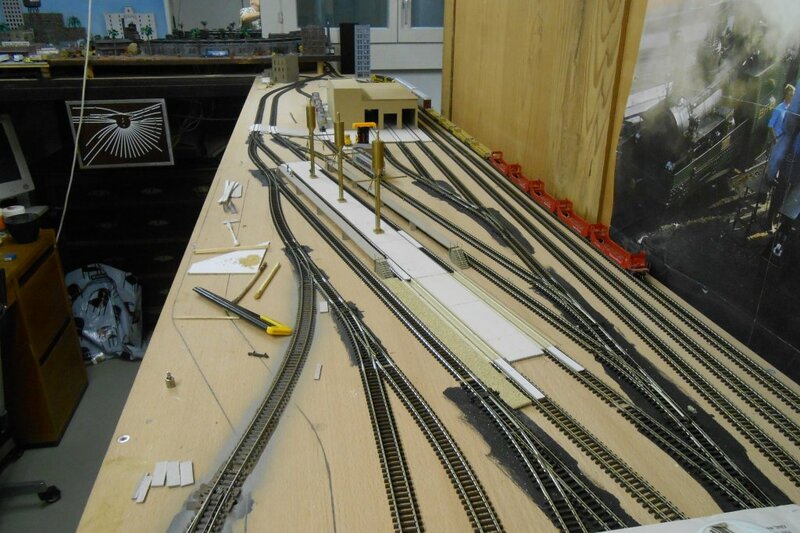 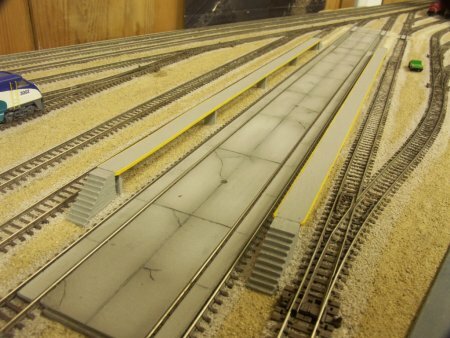 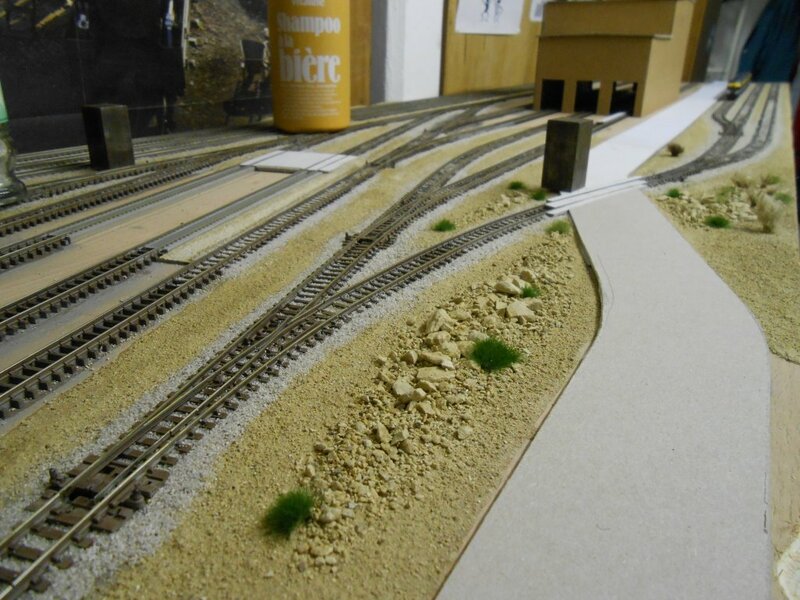 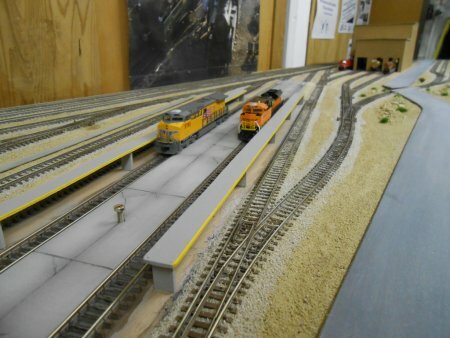 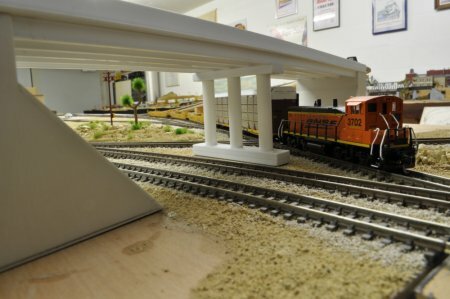 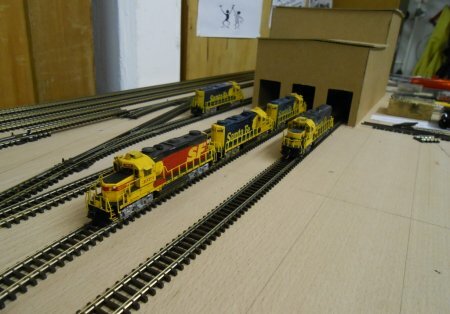 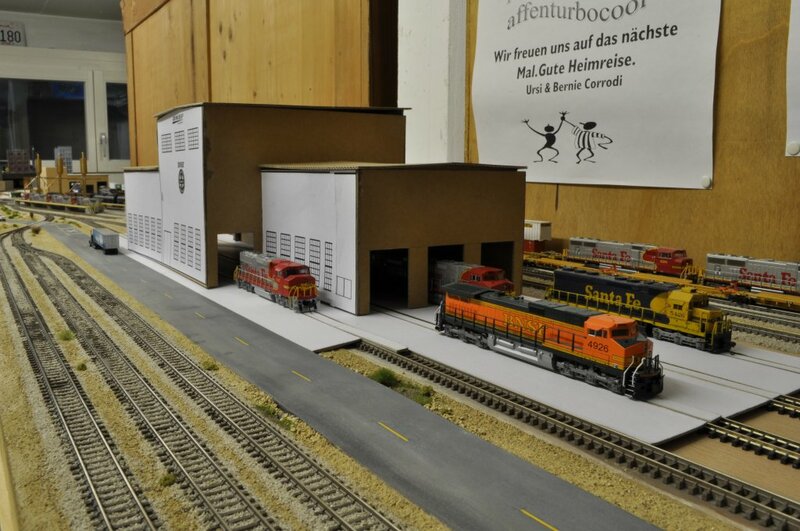 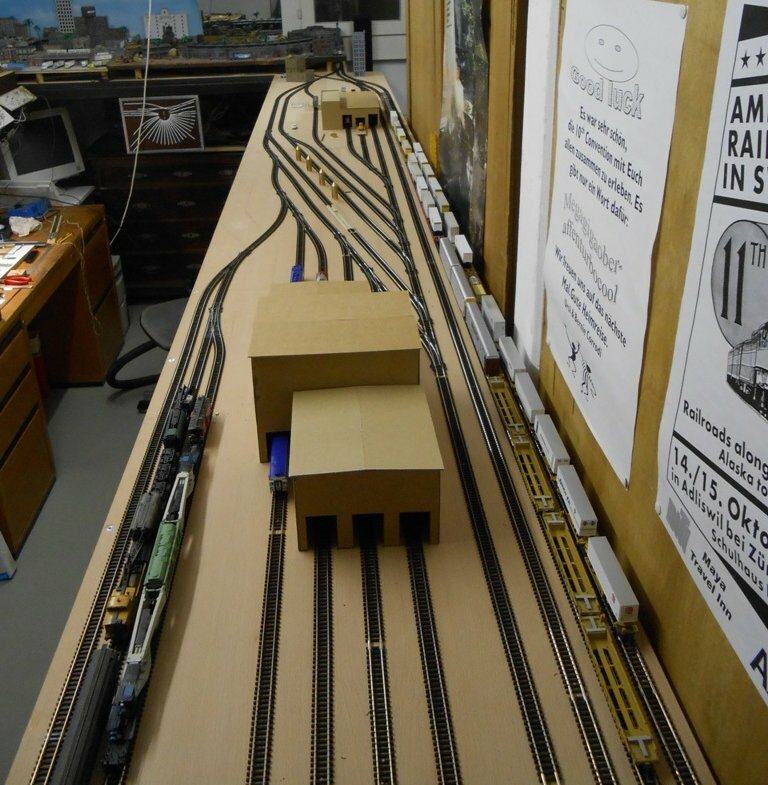 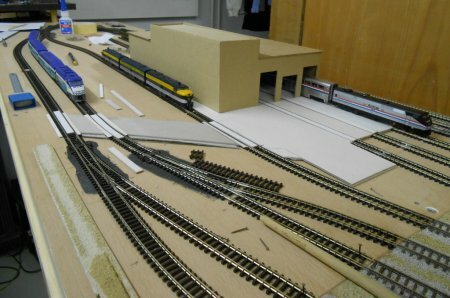 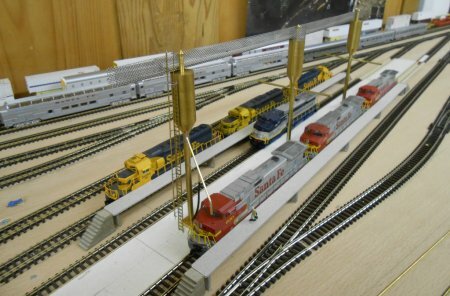 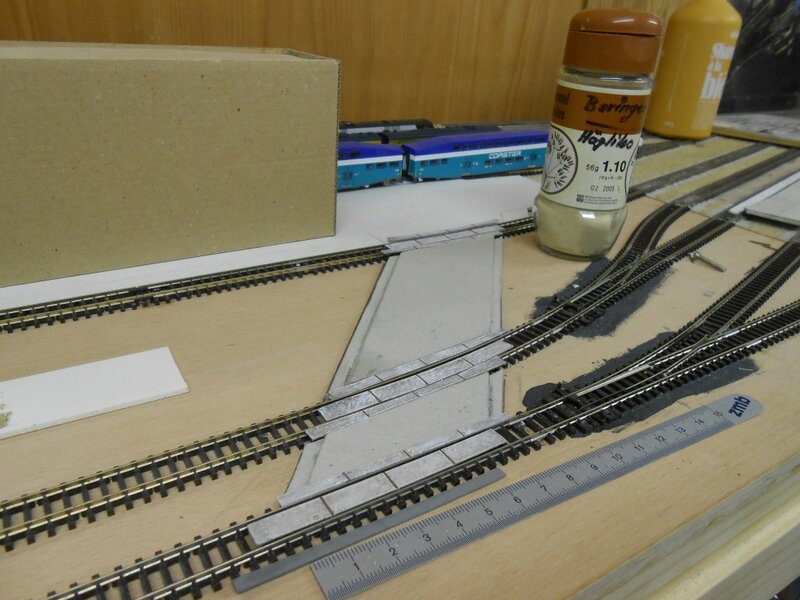 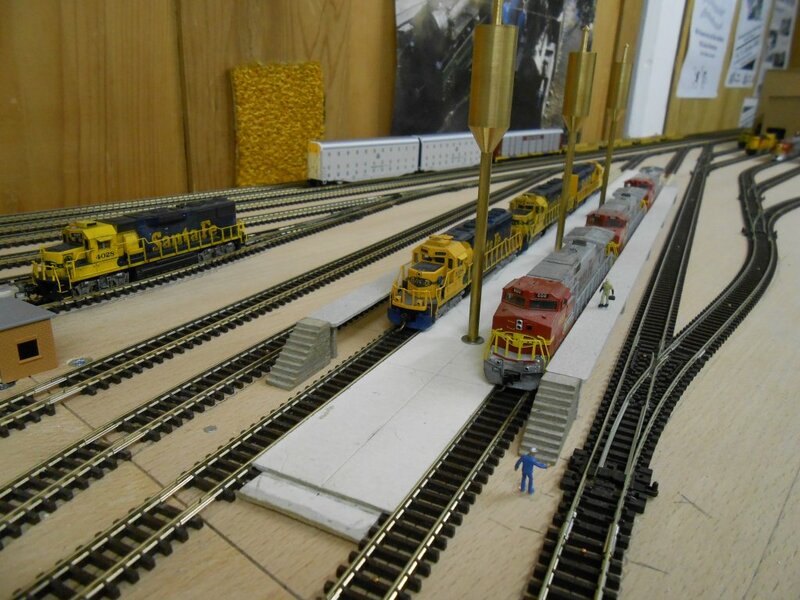 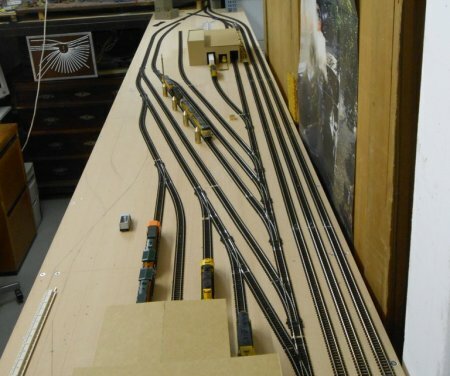 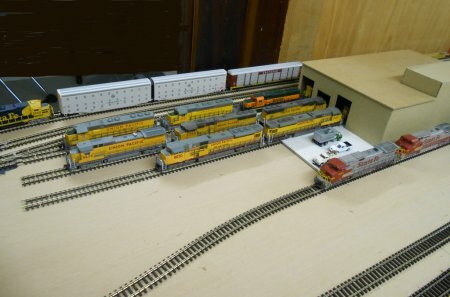 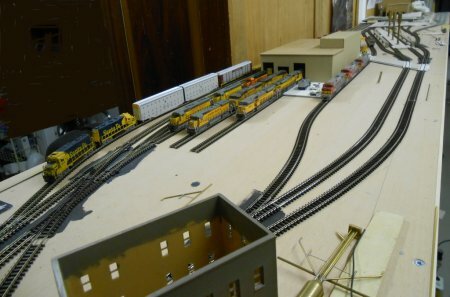 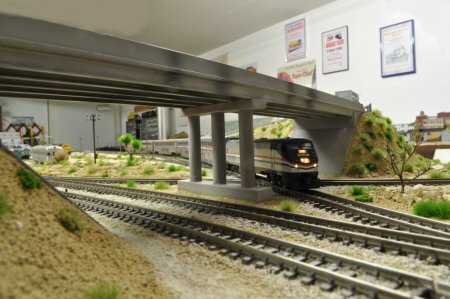 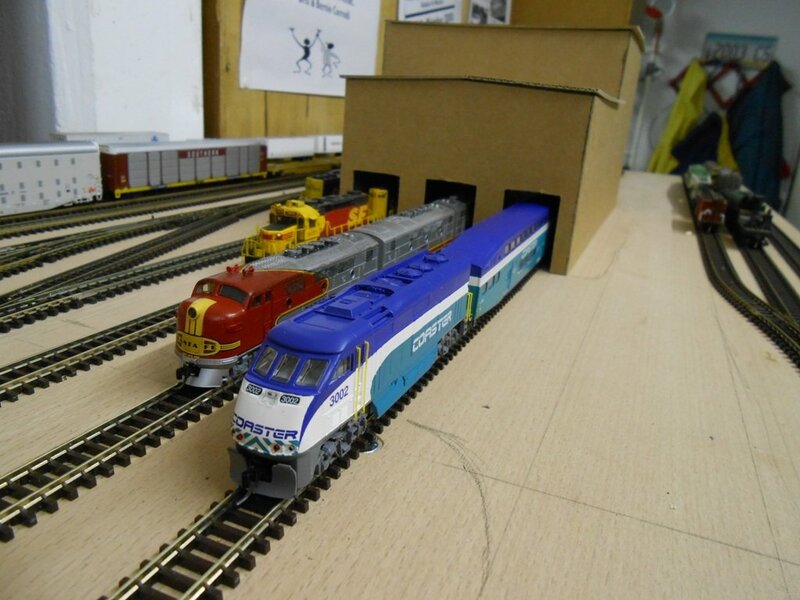 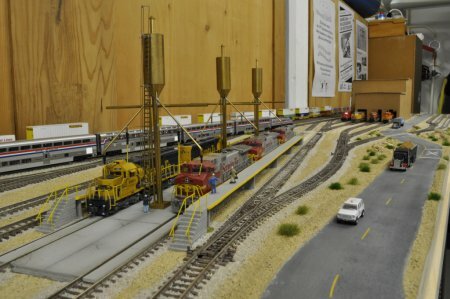 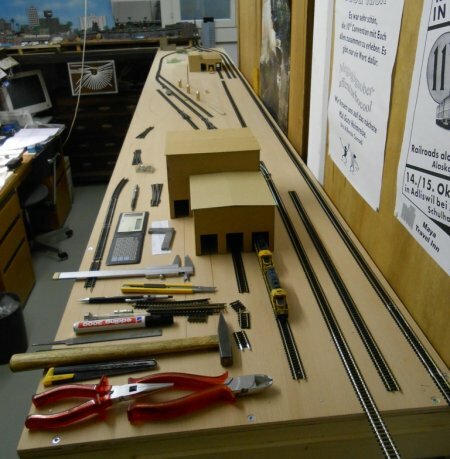 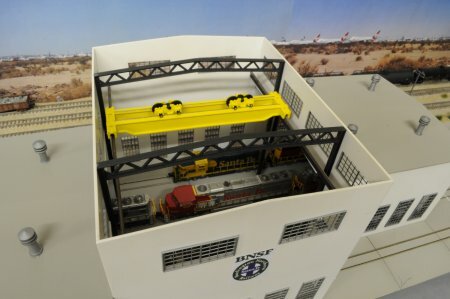 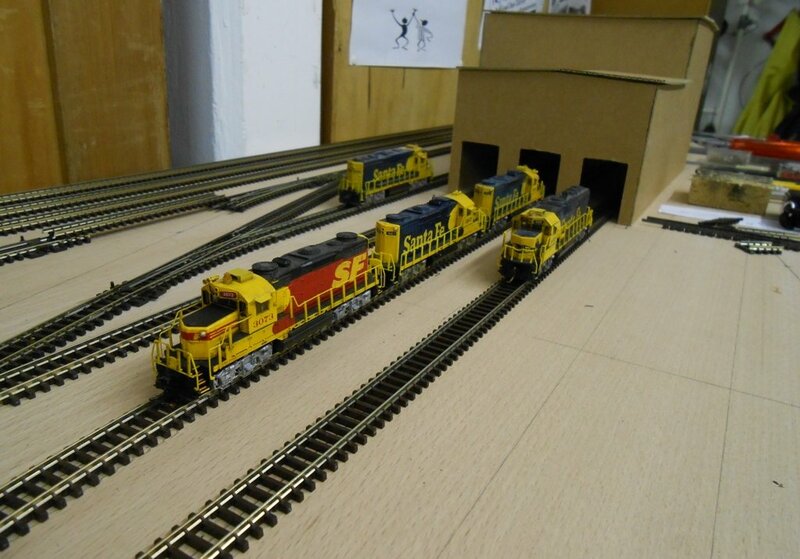 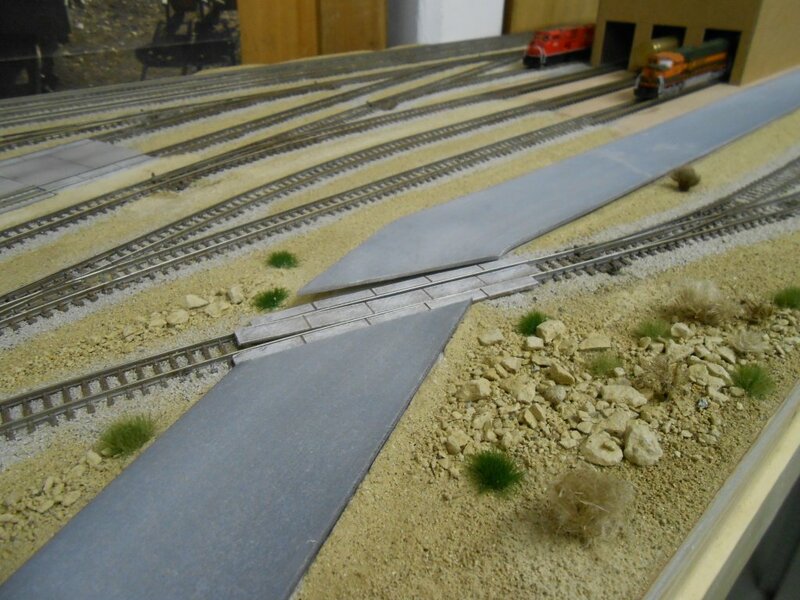 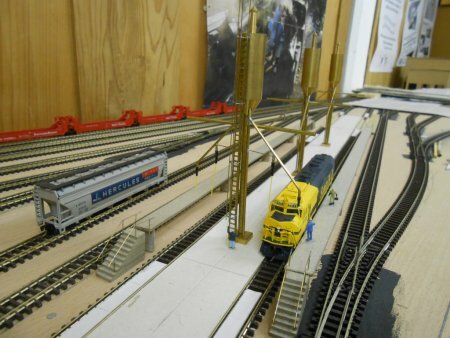 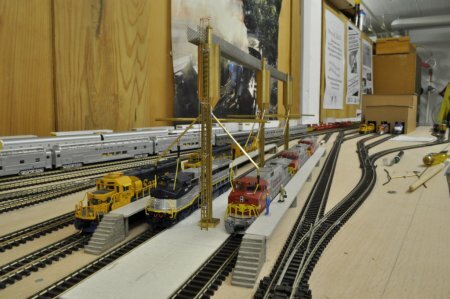 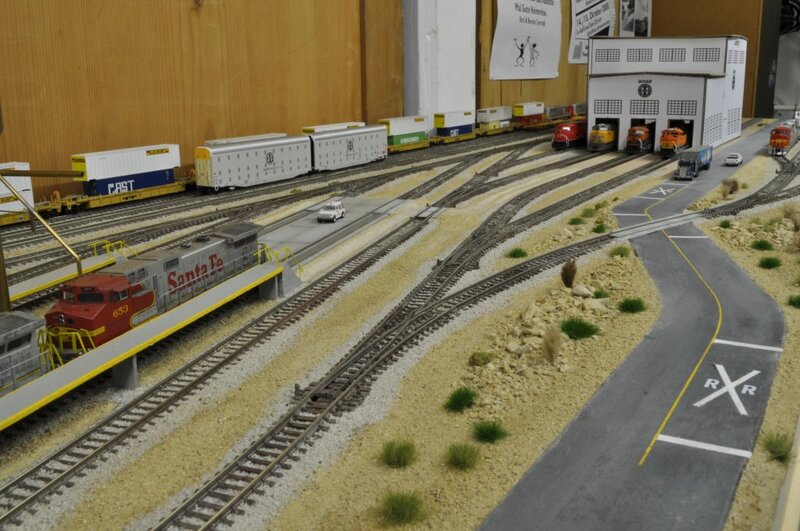 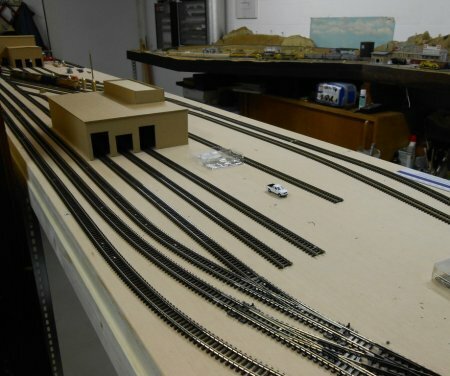 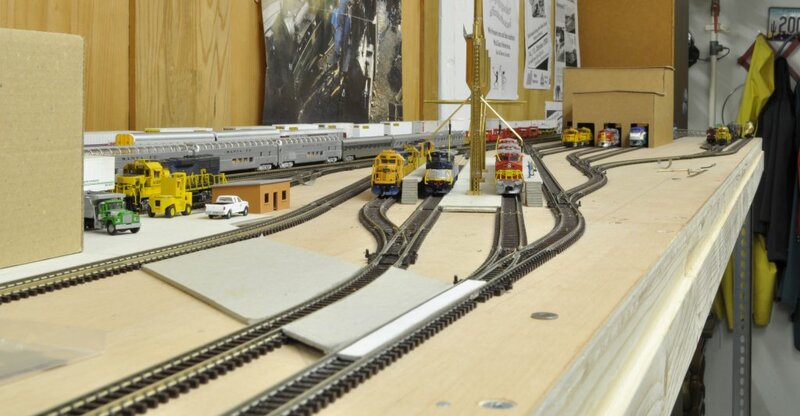 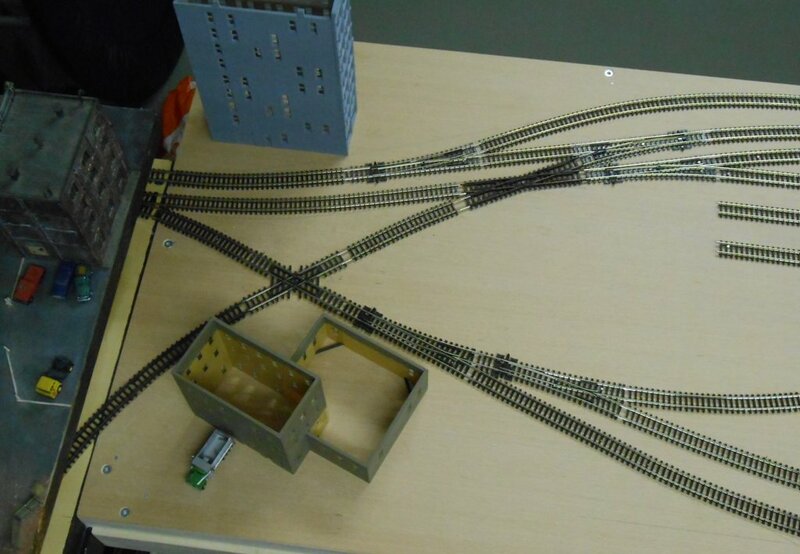 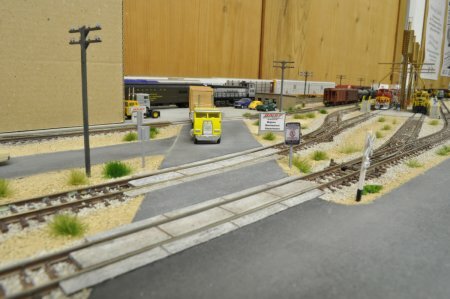 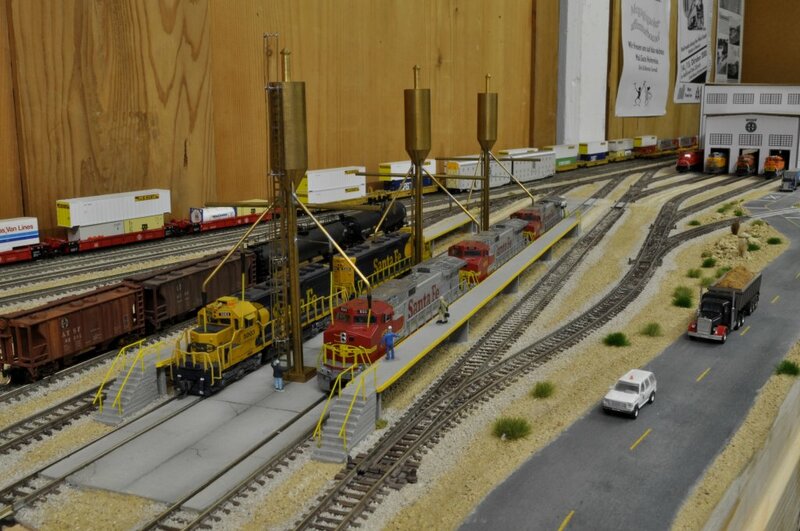 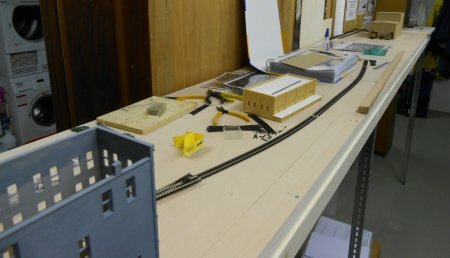 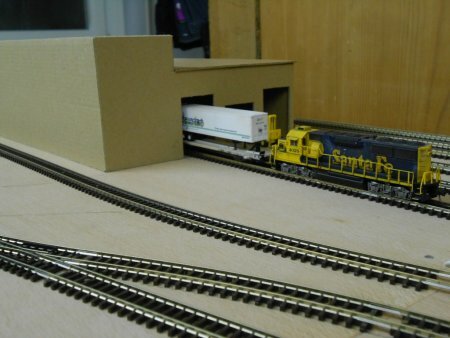 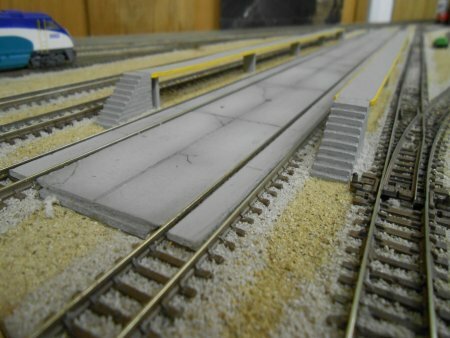 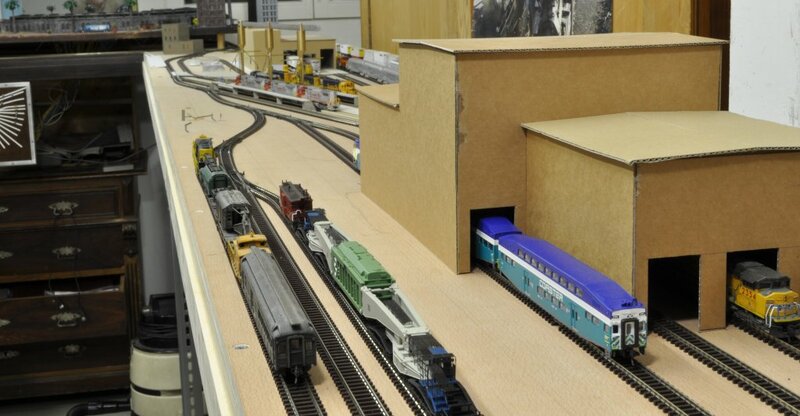 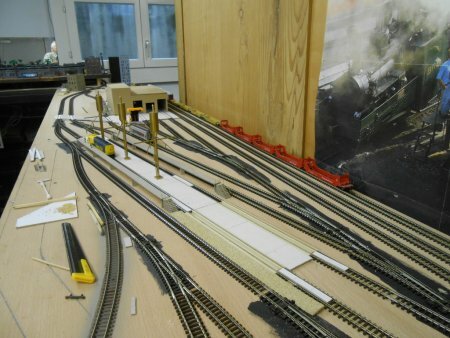 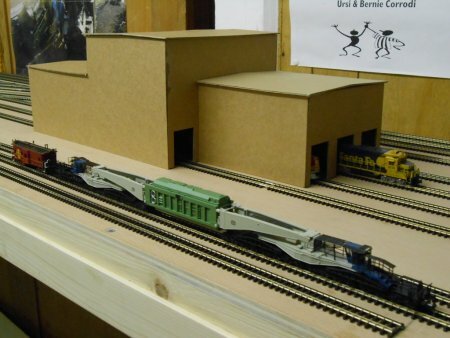 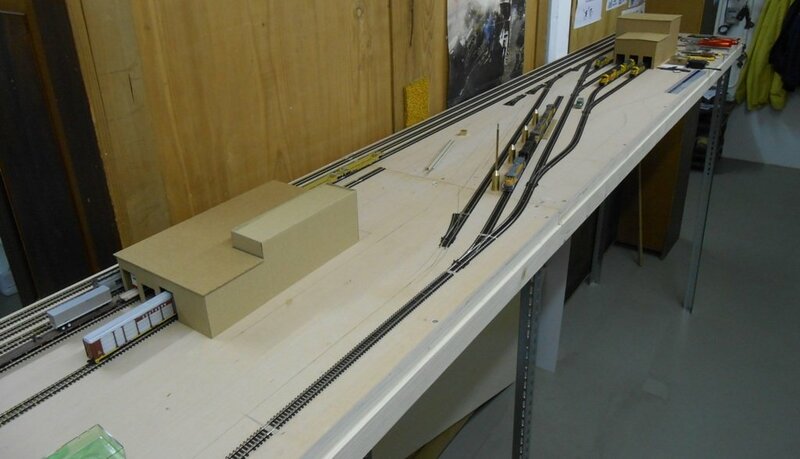 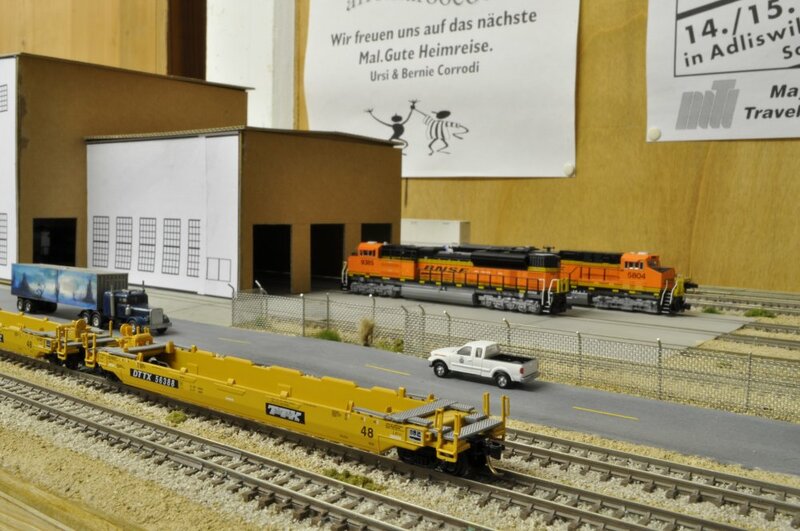 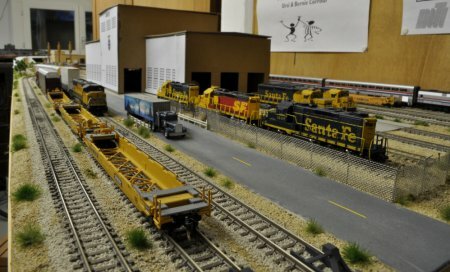 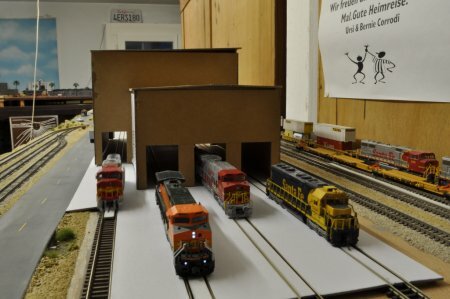 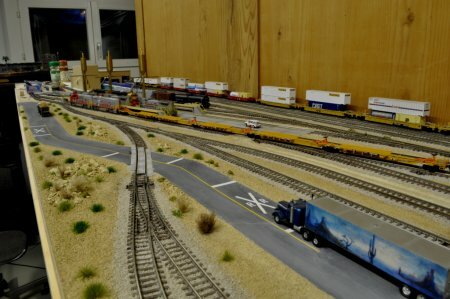 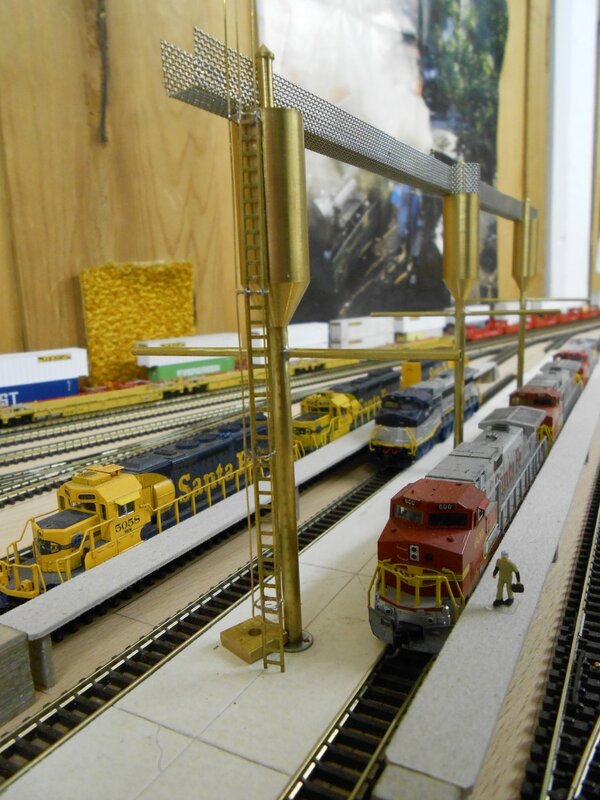 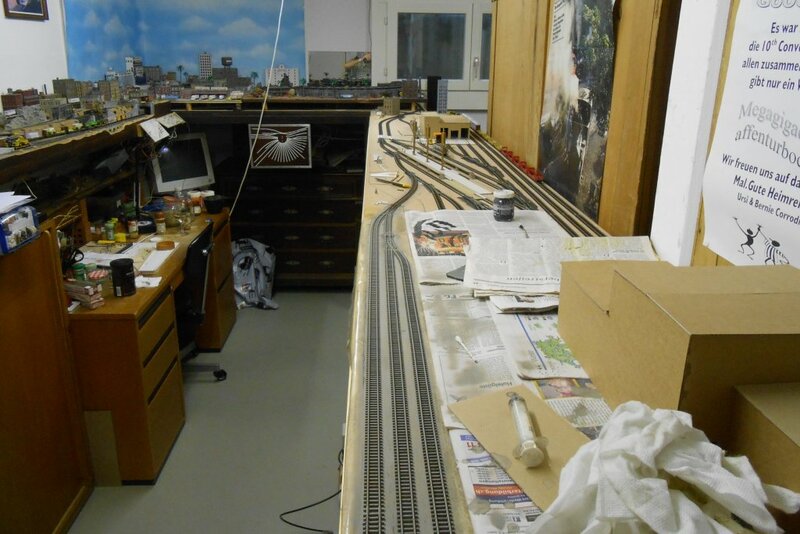 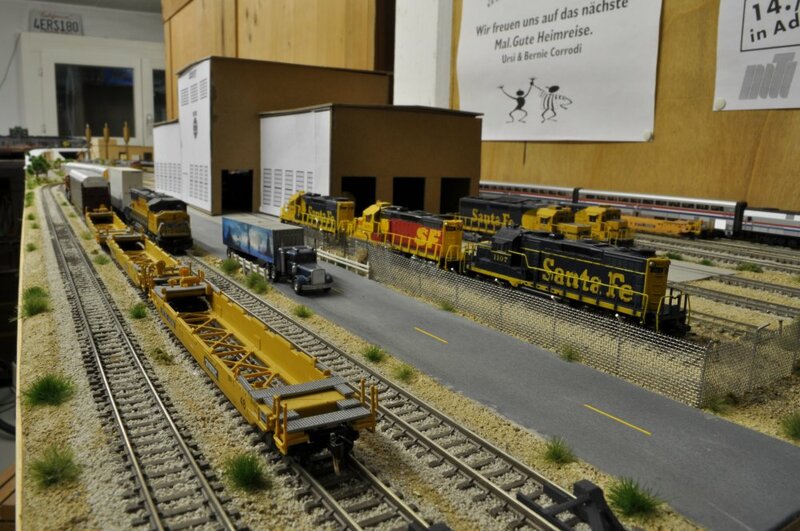 The basic idea for building this Terminal came from the "Golden Spike" Layout presented during the 3rd Convention in Rodgau (Frankfurt) in October 2011. 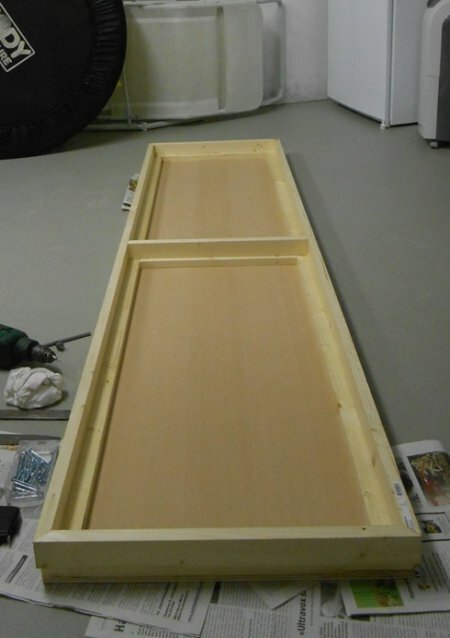 Material = Poplar Plywood 10 mm is glued and screwed on 1" x 2" frame. 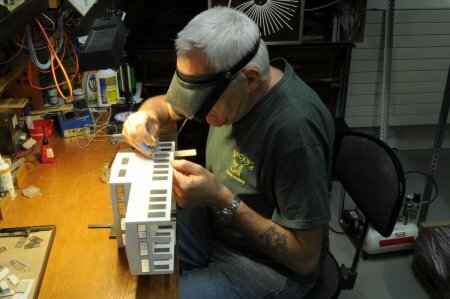 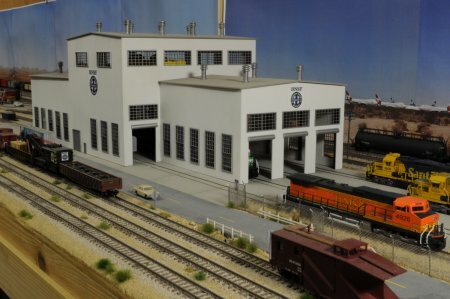 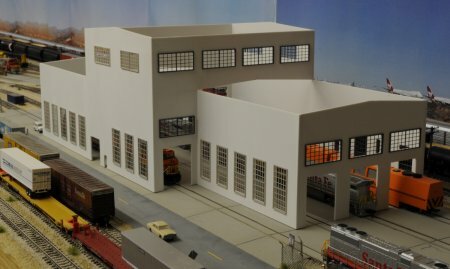 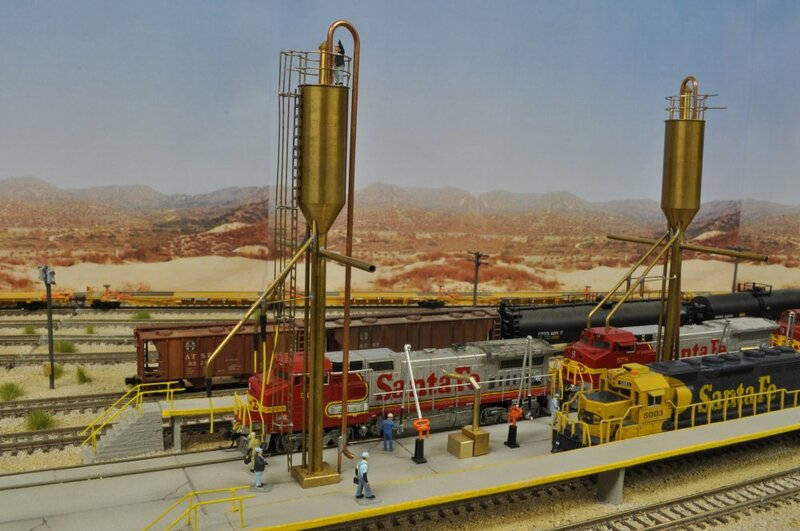 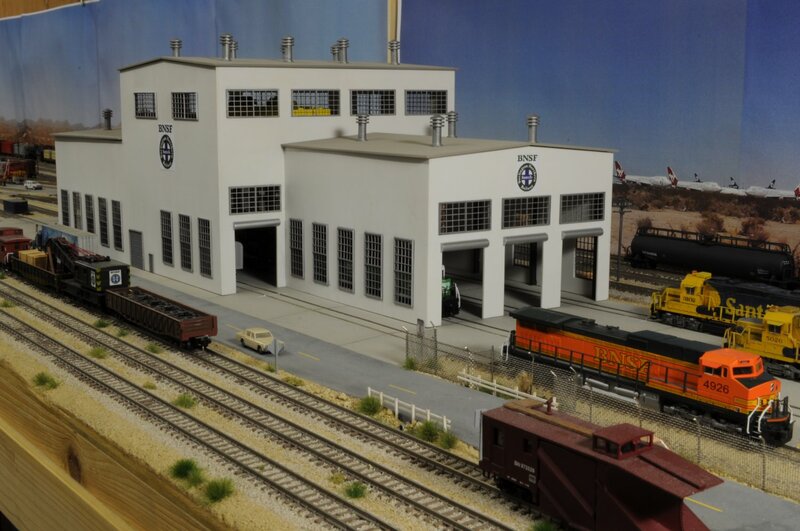 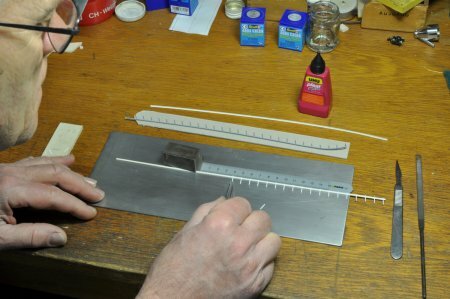 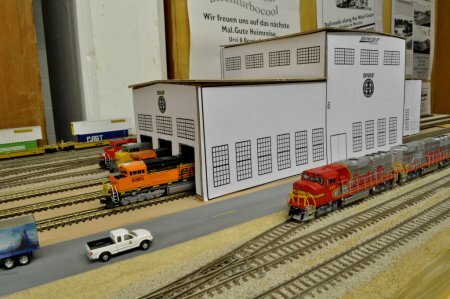 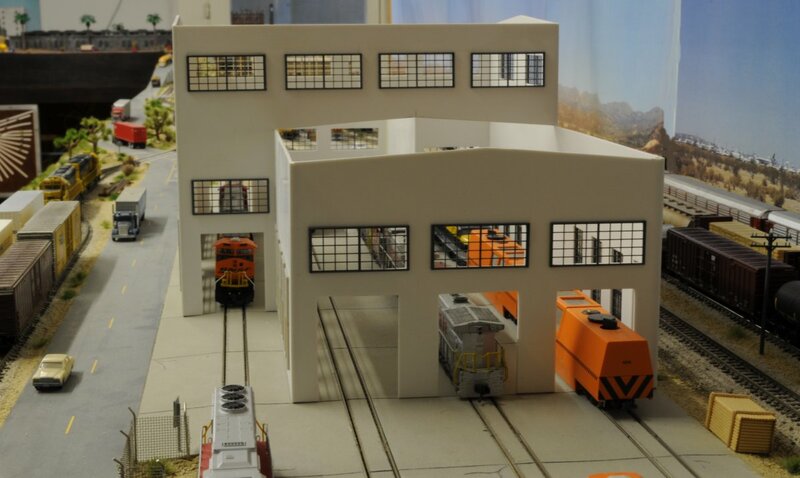 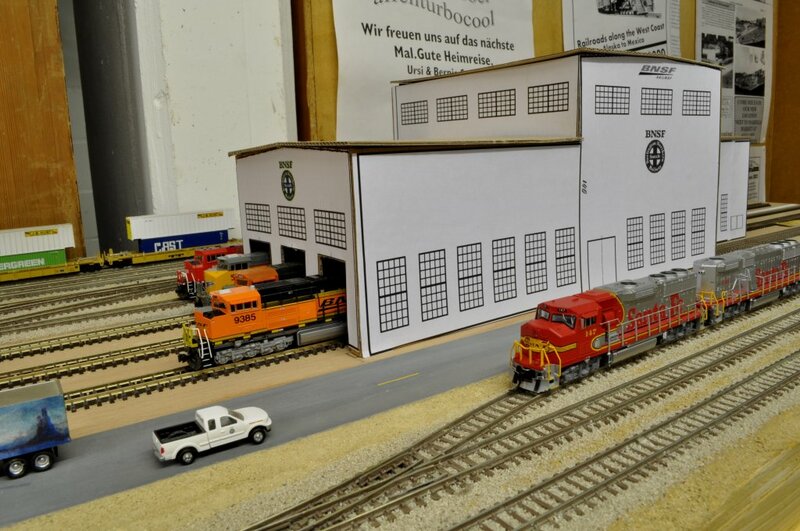 The Engine Facility with the Sanding Towers requires scratch building. 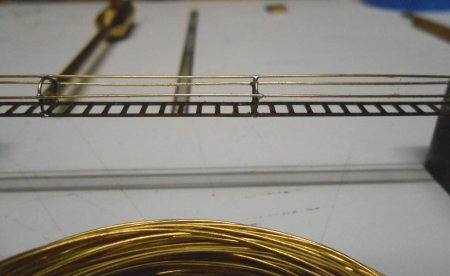 Brass is the ideal material but you should have the proper skills. 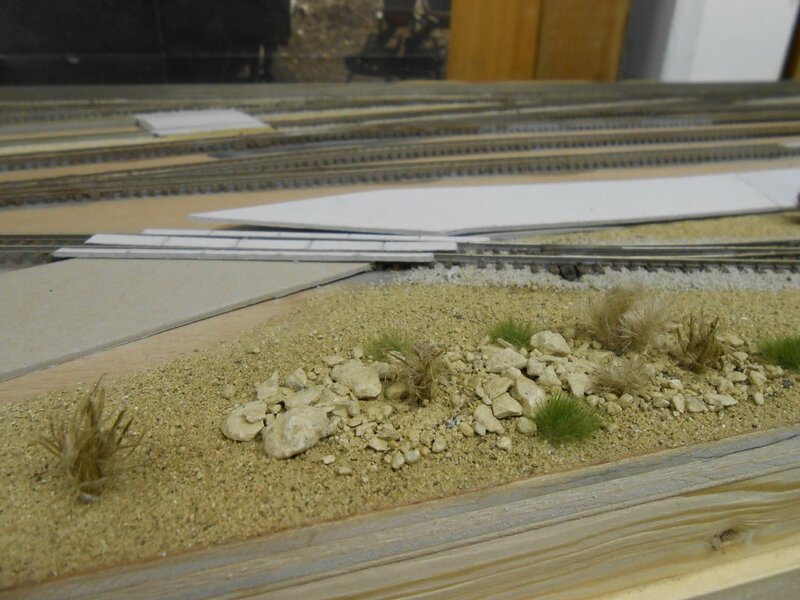 Landscaping has already been started. 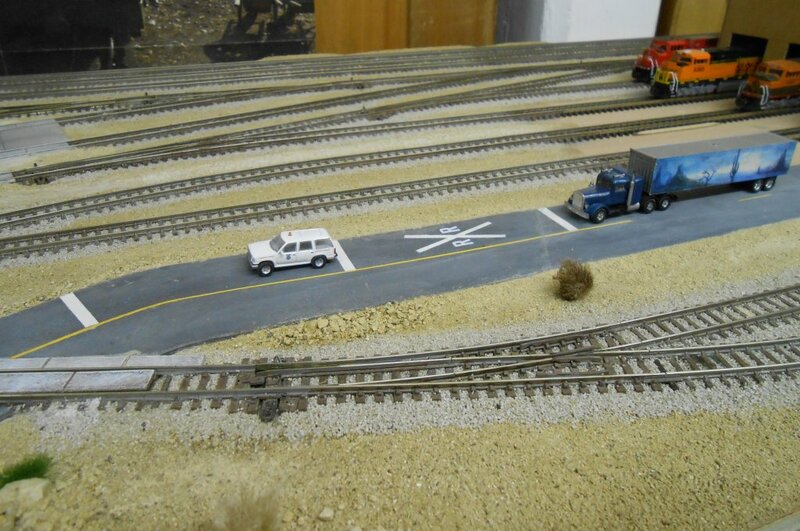 This Terminal needs service roads, RR-crossings and platforms. 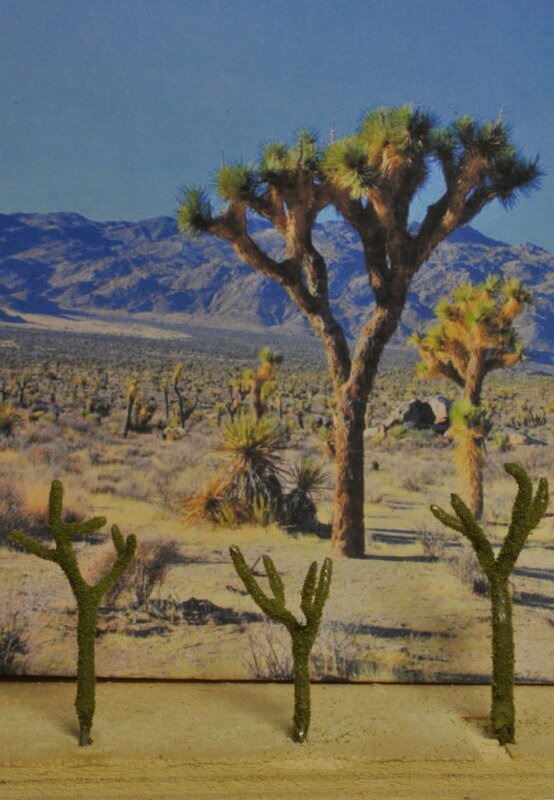 We can find typical Mojave Desert Vegetation. 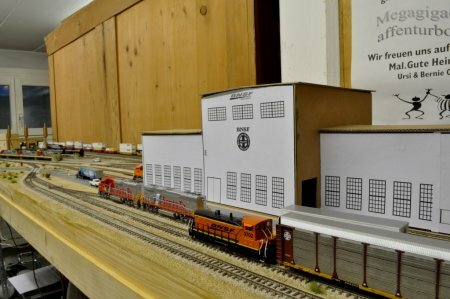 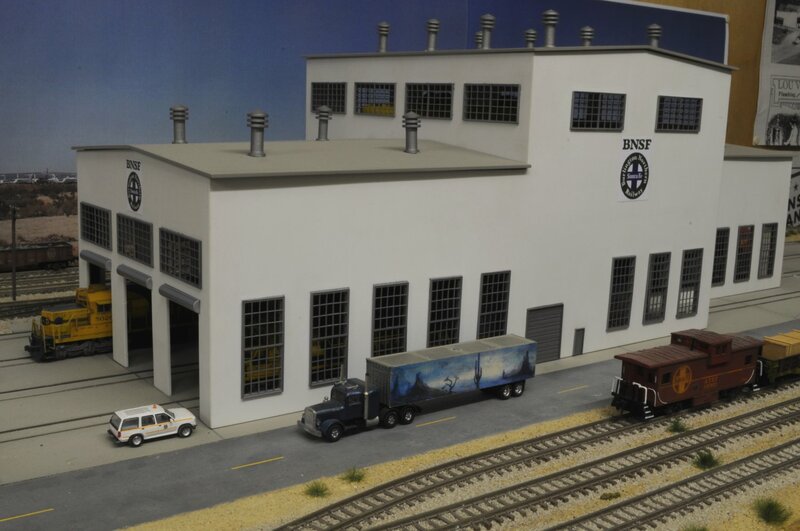 To get a better idea about the look of the Diesel Shop Building, windows and logos have been printed on paper and glued on the cardboard mockup. 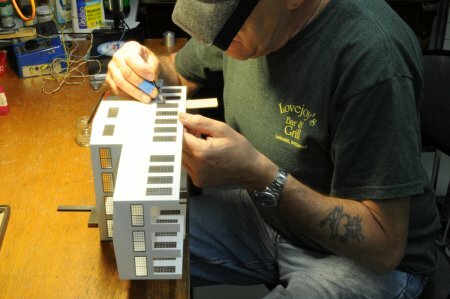 It sure gives an idea how the finished building would be looking. 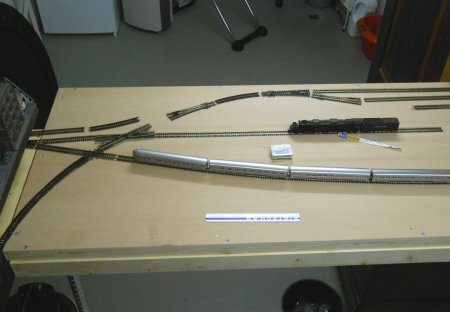 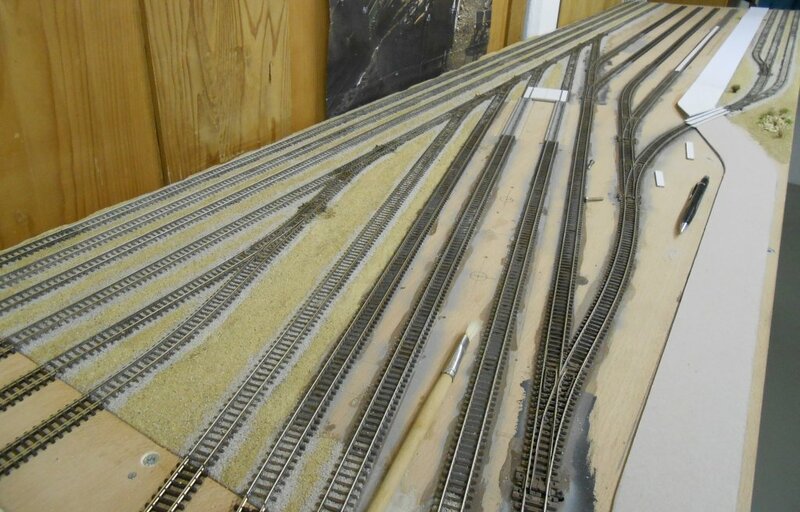 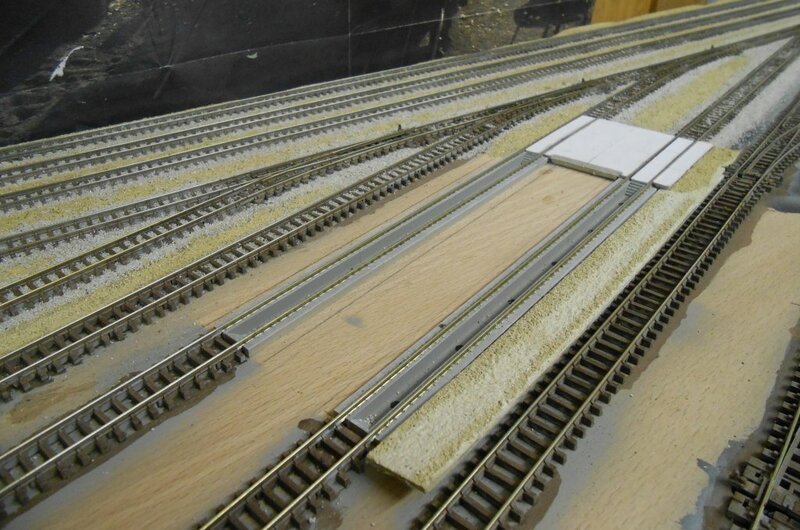 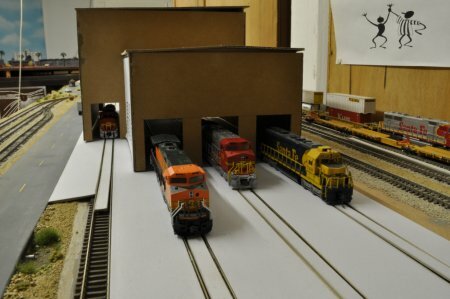 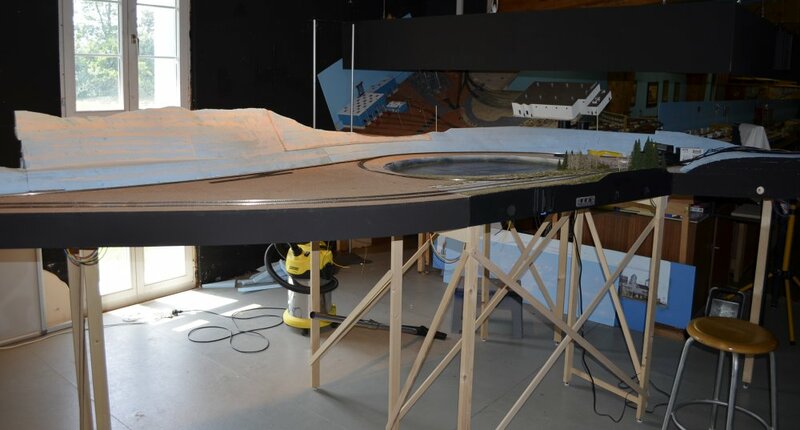 In addition, cardboard was cut to size to be placed between the tracks an both sides of the shops. 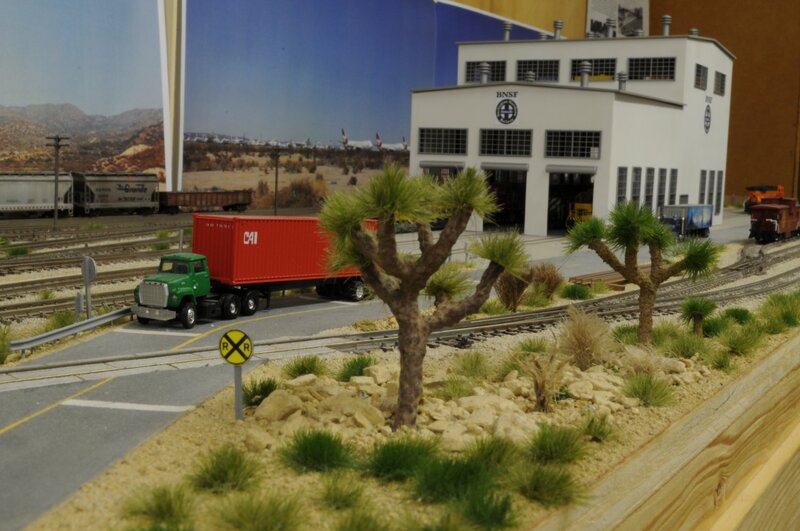 To get the perfect Mojave Desert look, this Terminal will get Joshua Trees. 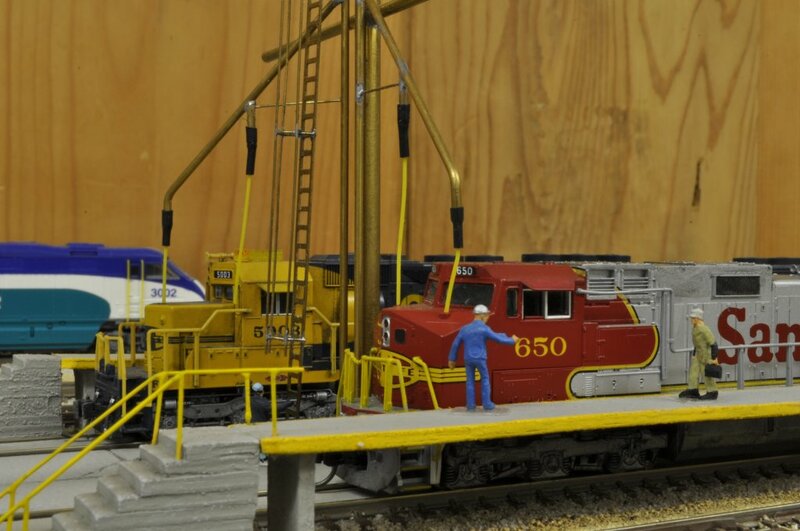 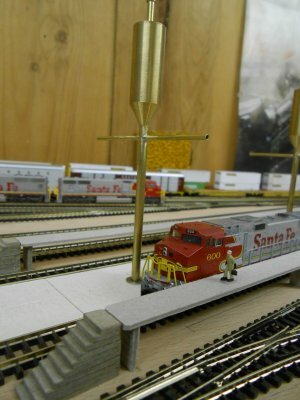 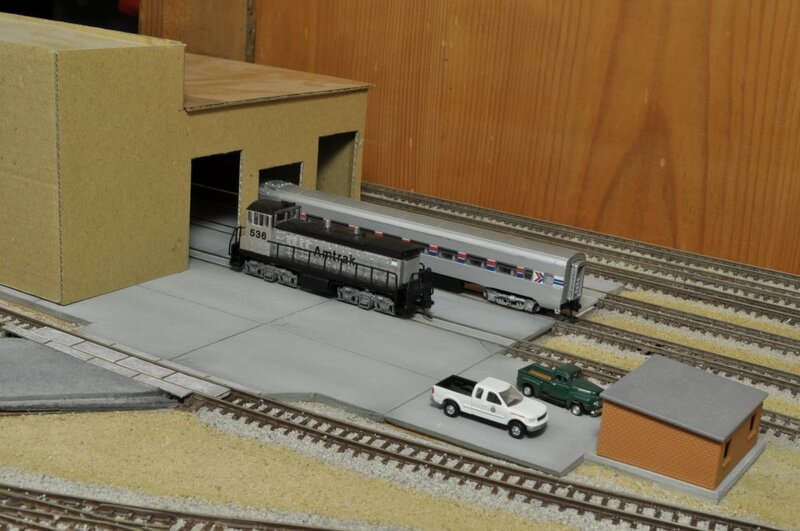 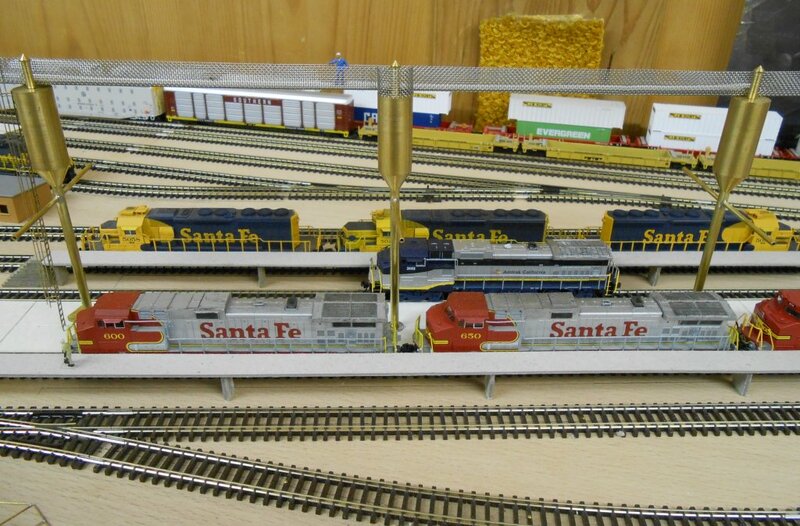 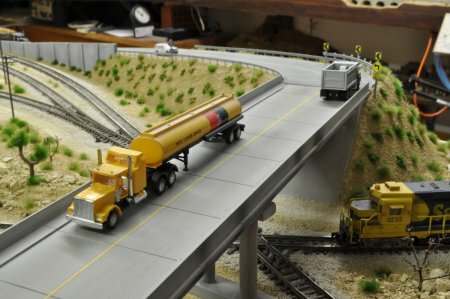 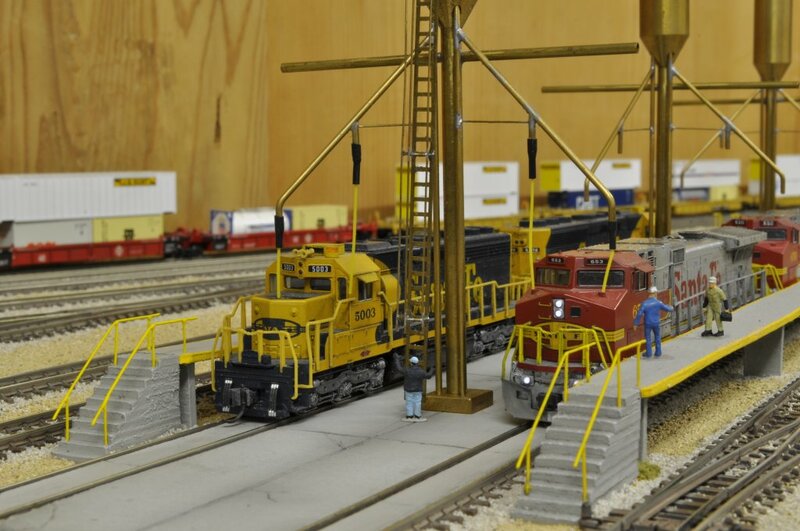 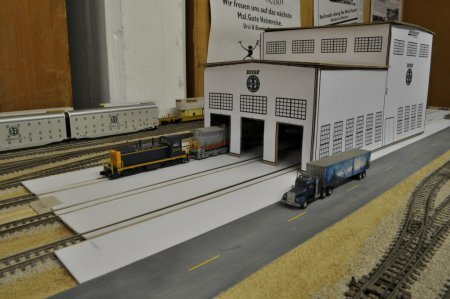 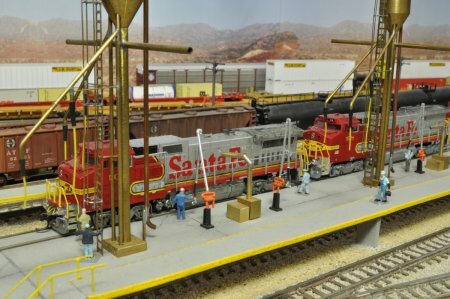 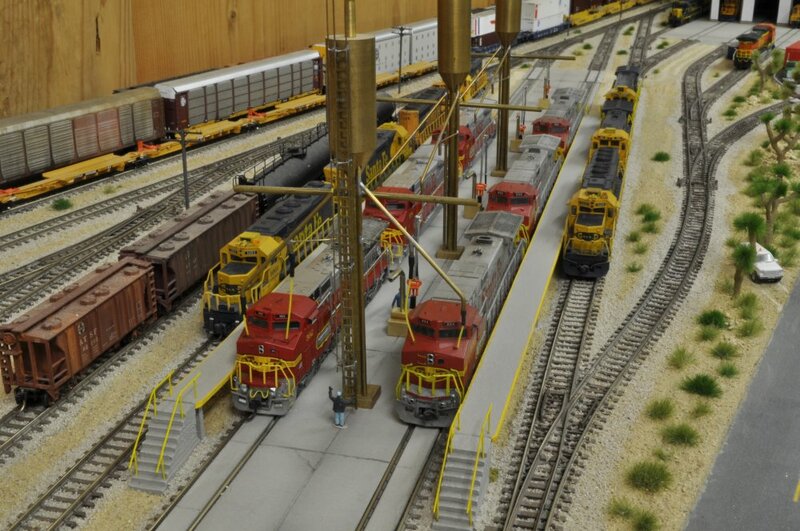 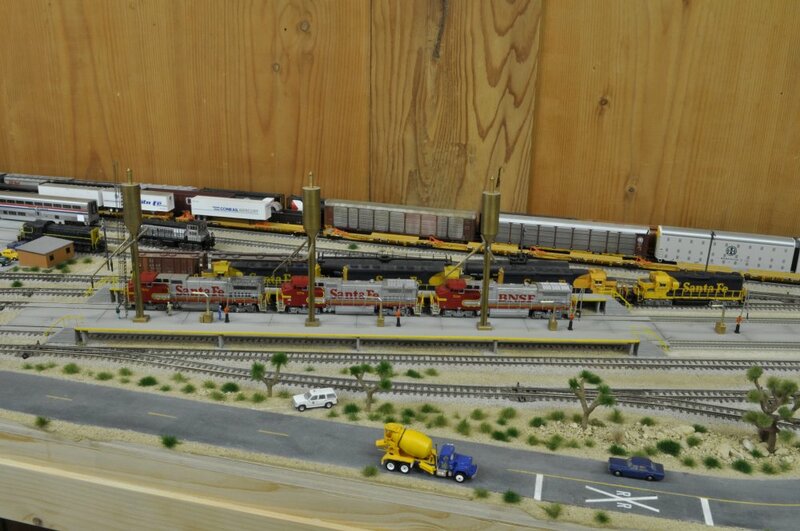 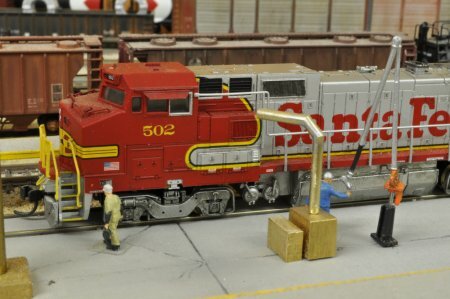 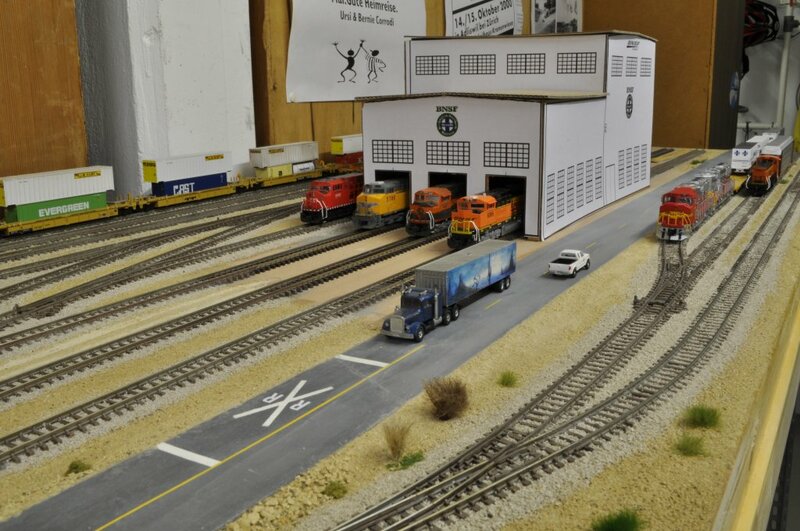 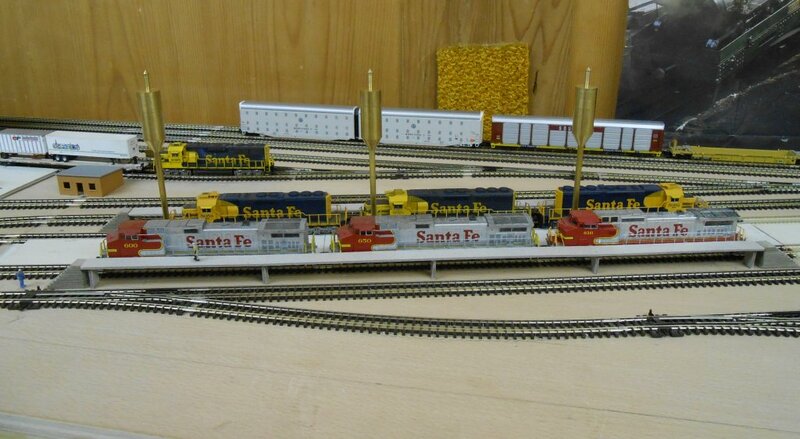 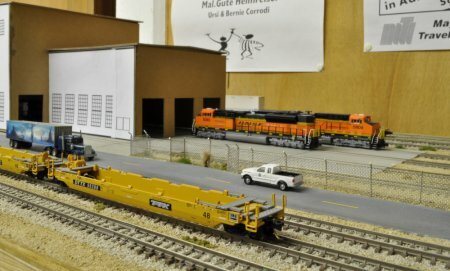 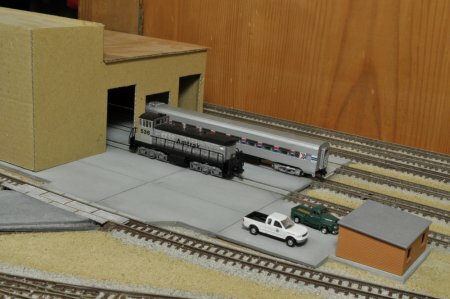 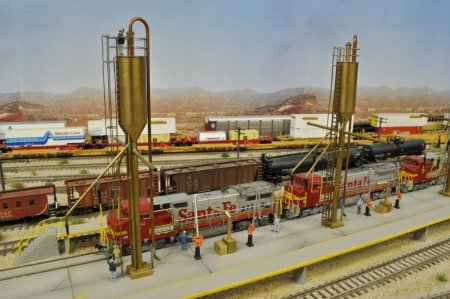 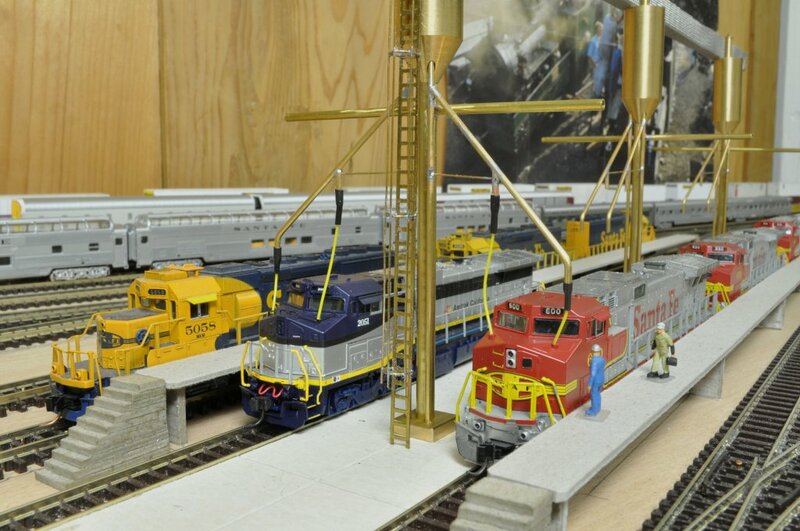 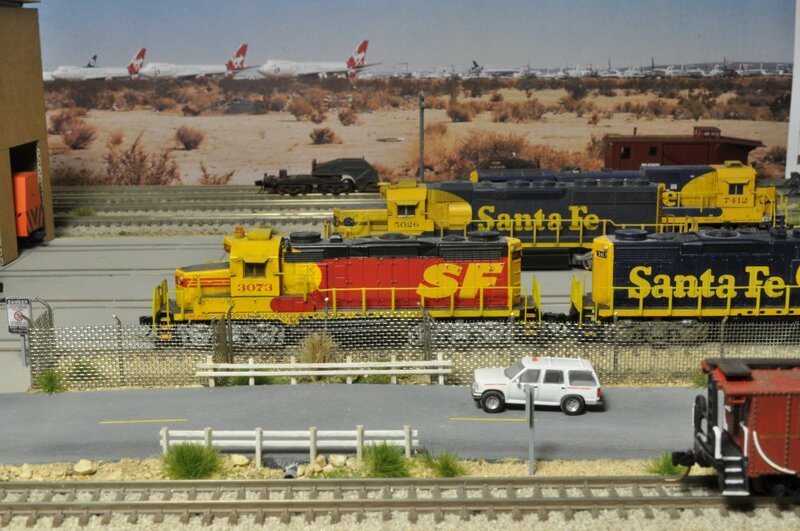 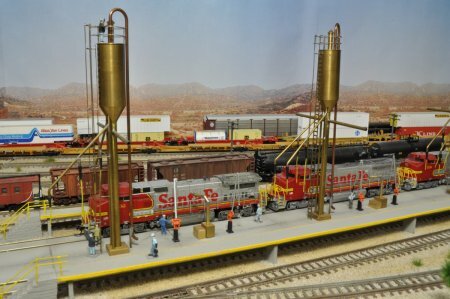 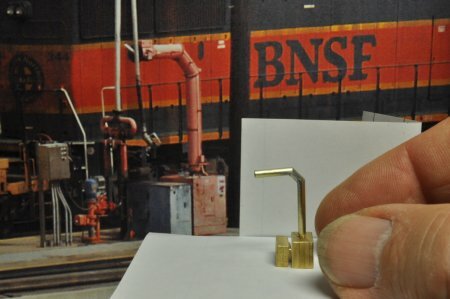 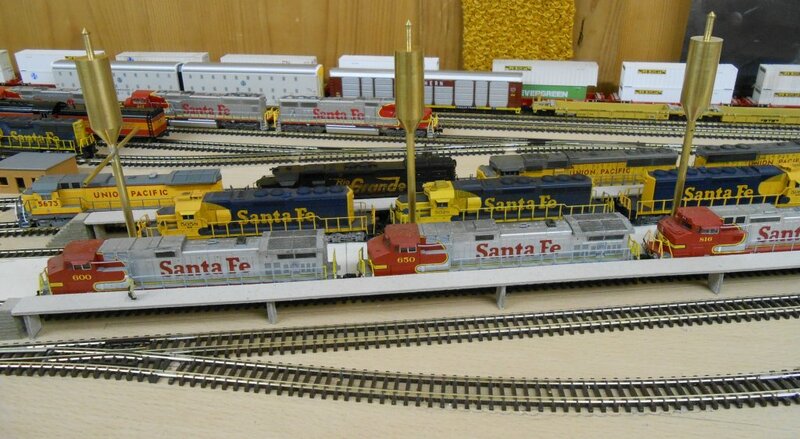 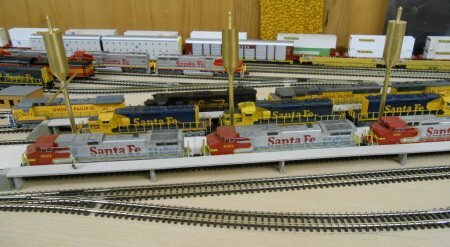 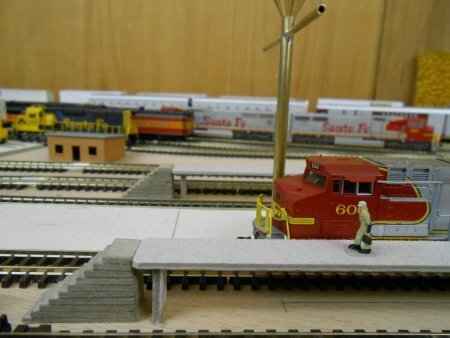 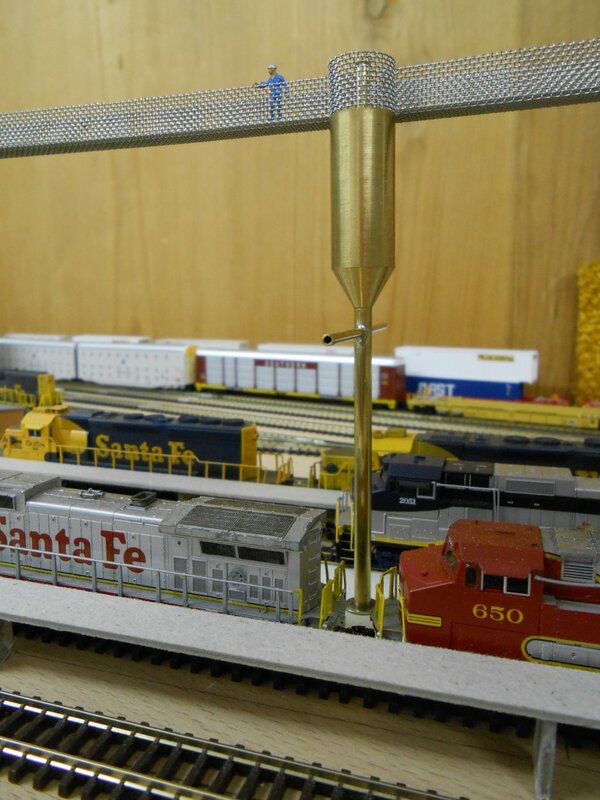 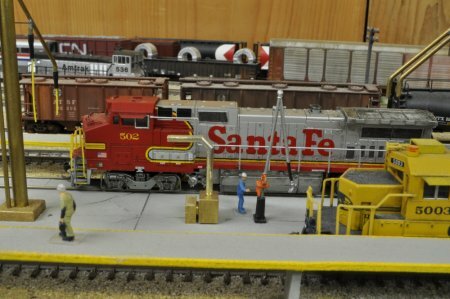 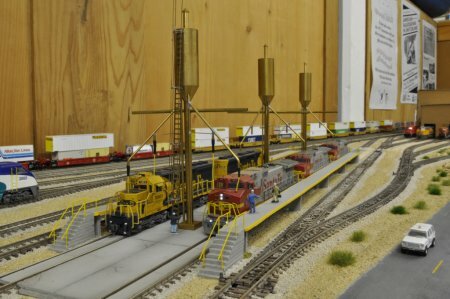 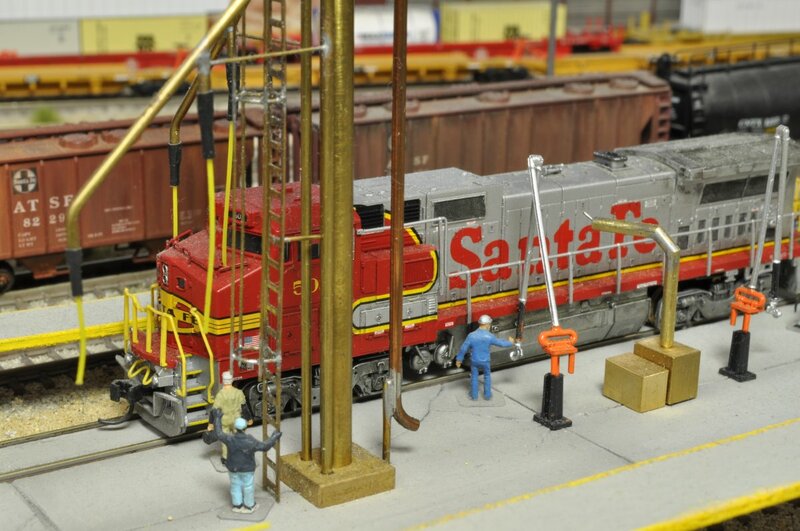 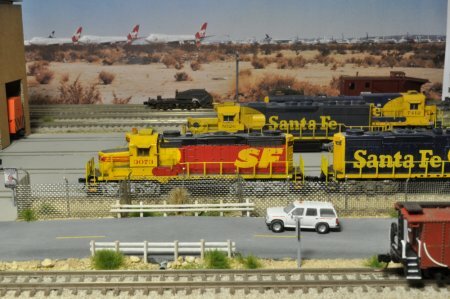 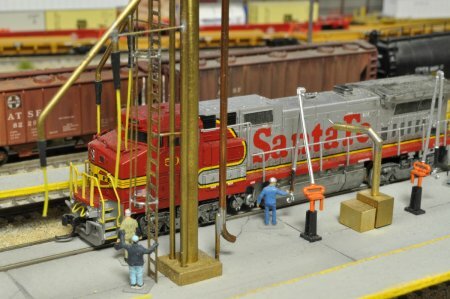 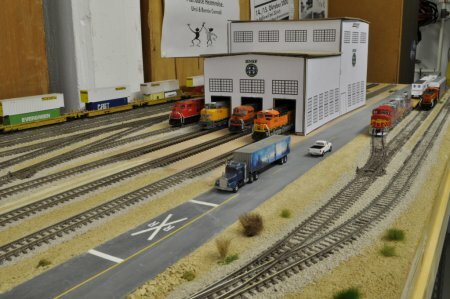 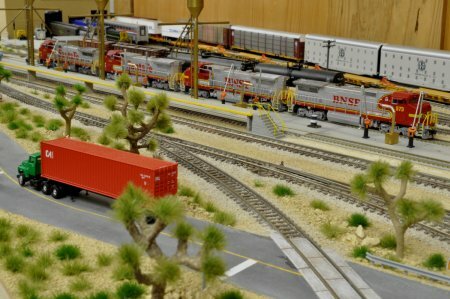 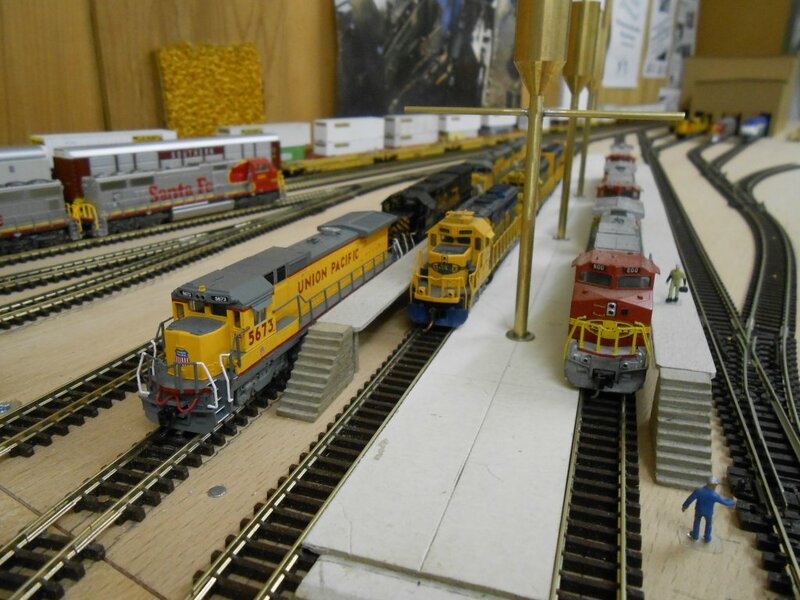 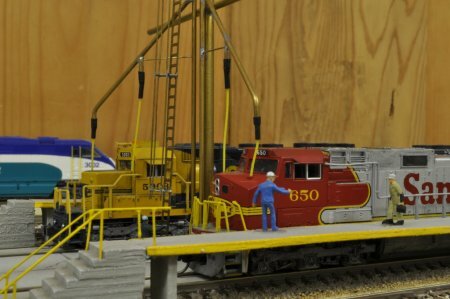 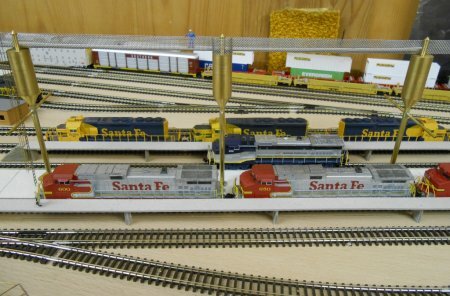 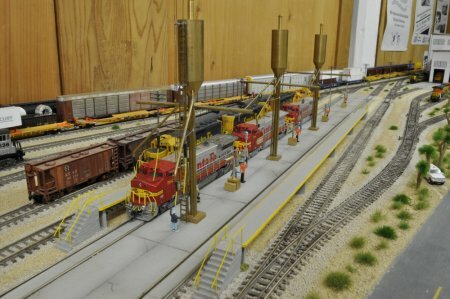 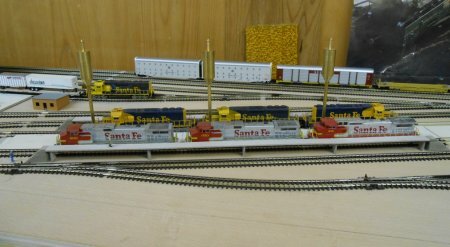 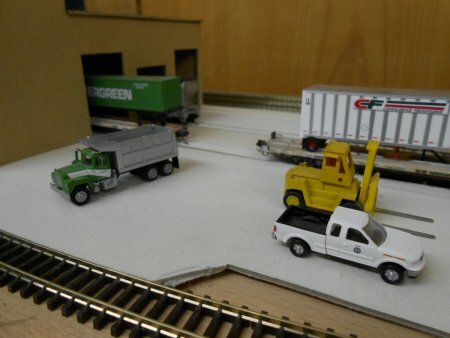 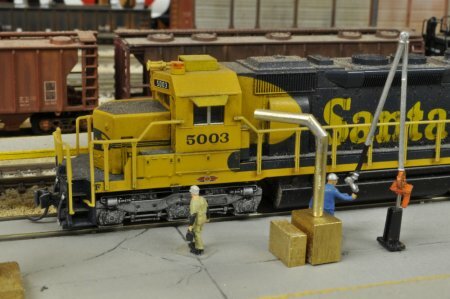 But there are no Joshuas available in N scale (1:160). Therefore, Eugen decided to build his own miniature Joshuas. 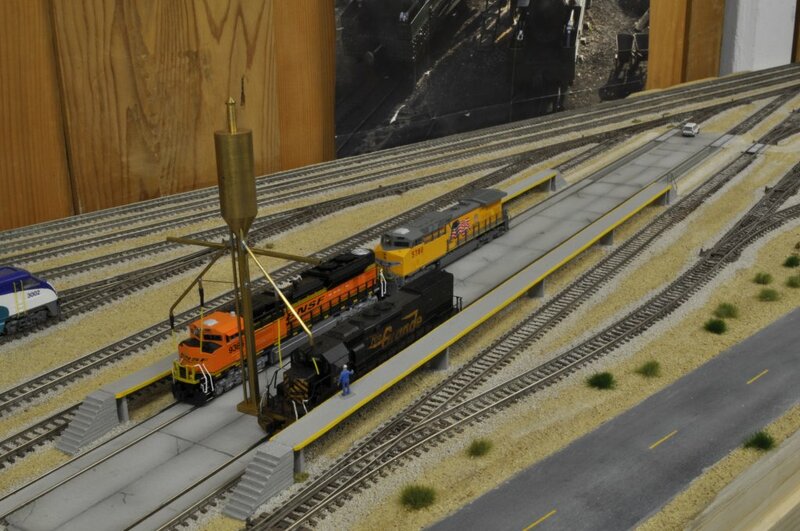 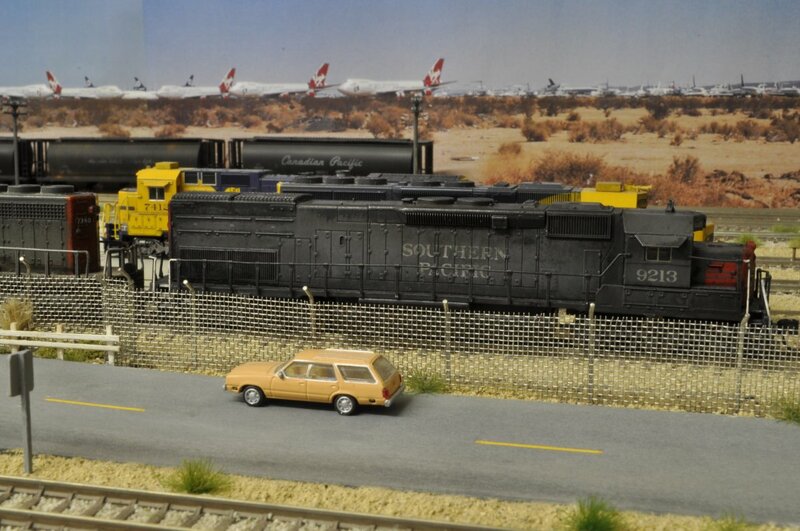 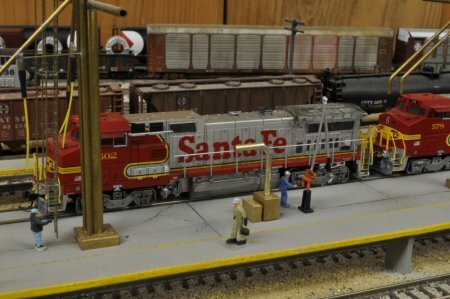 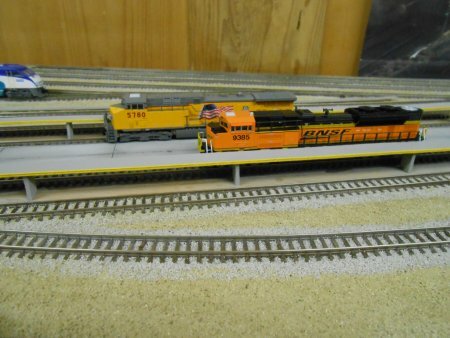 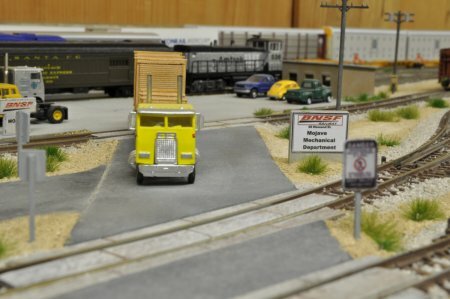 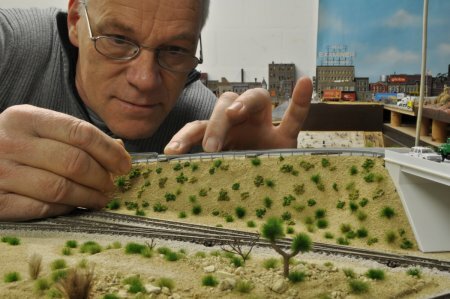 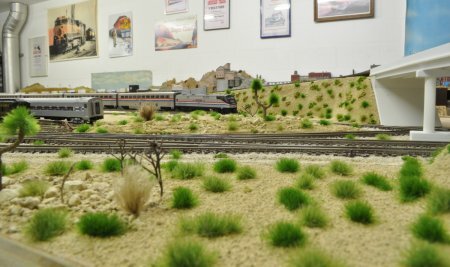 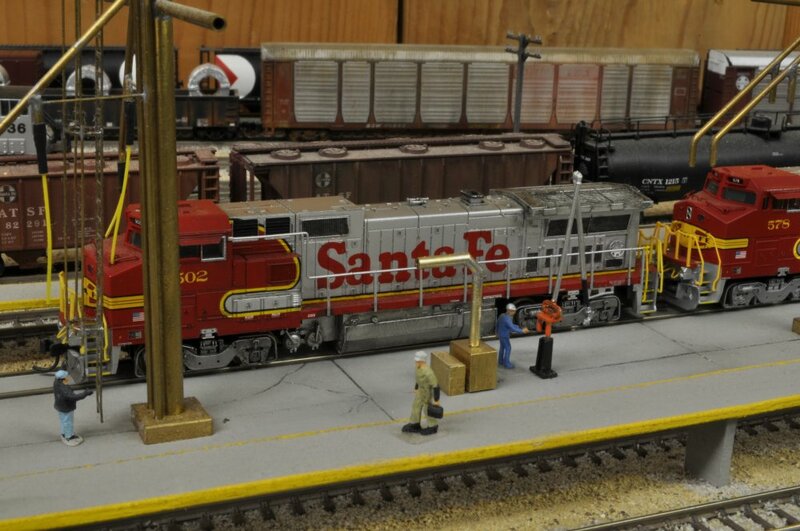 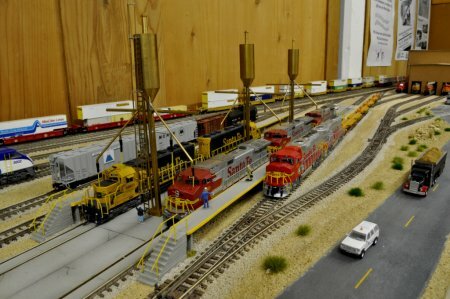 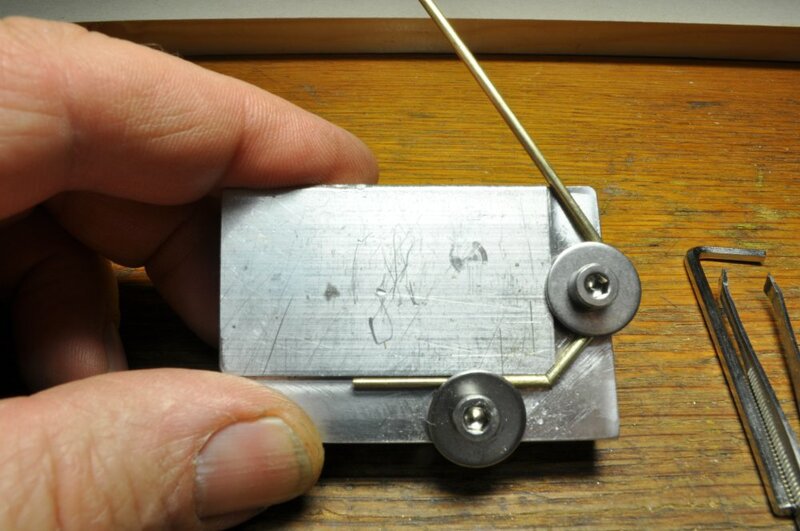 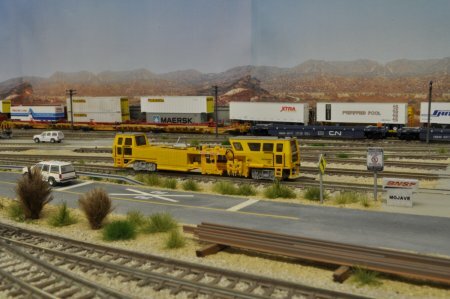 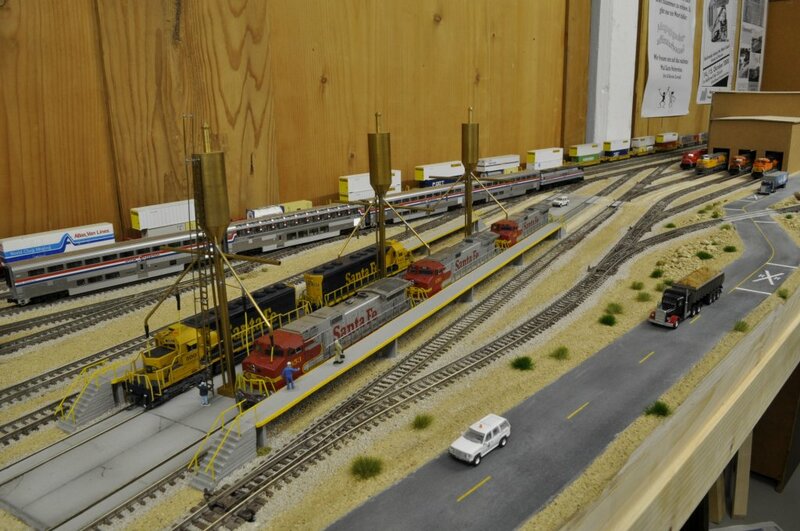 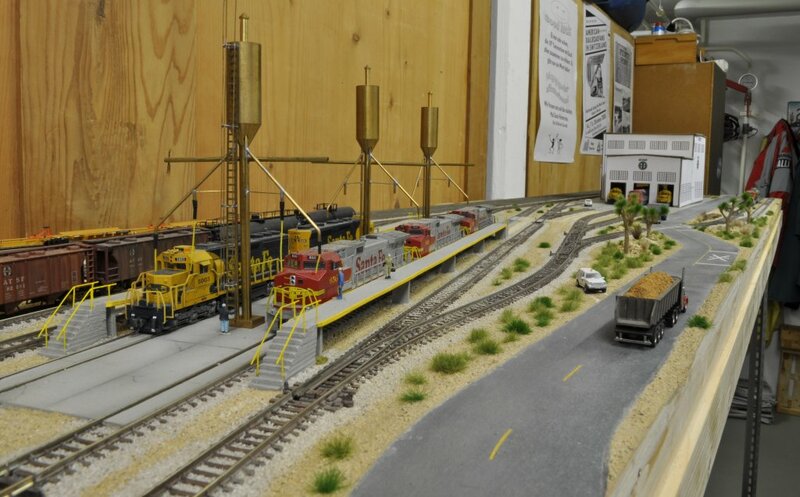 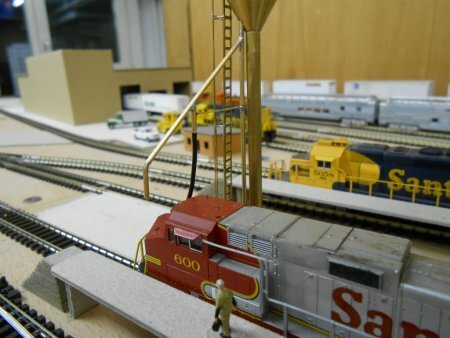 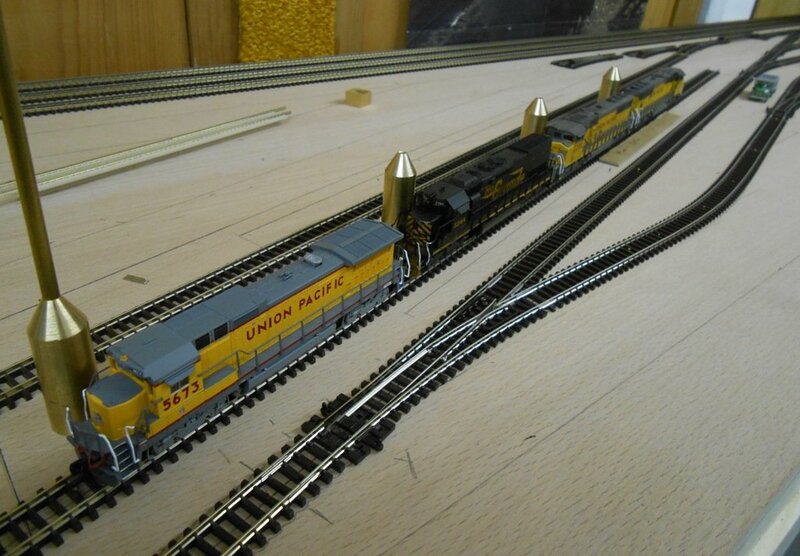 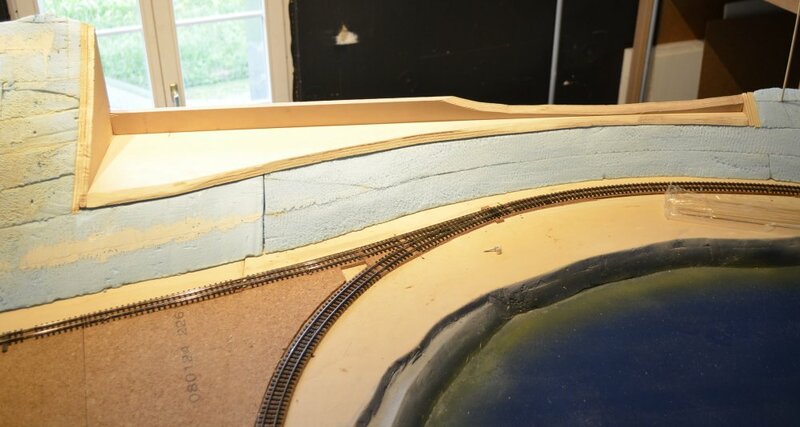 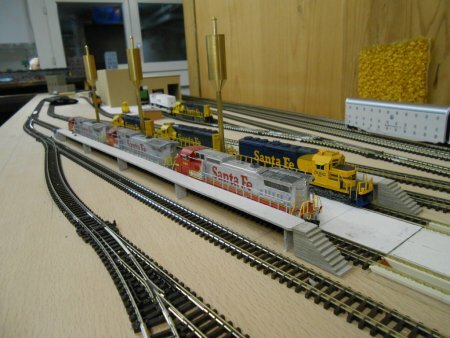 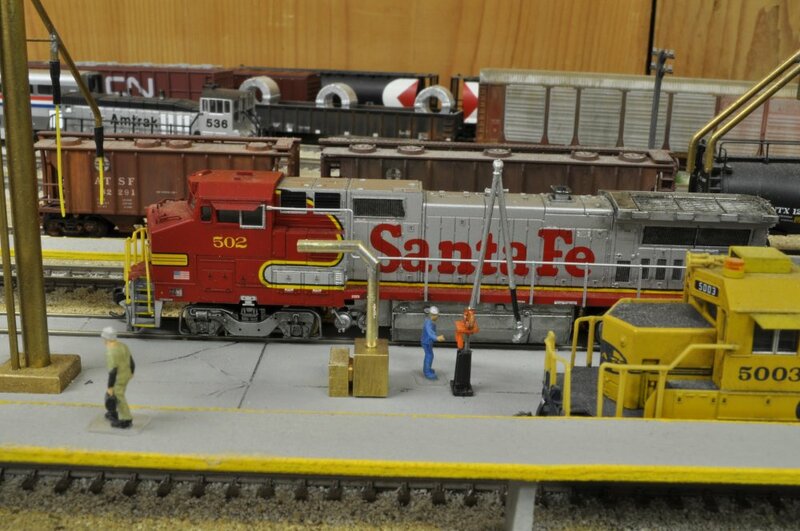 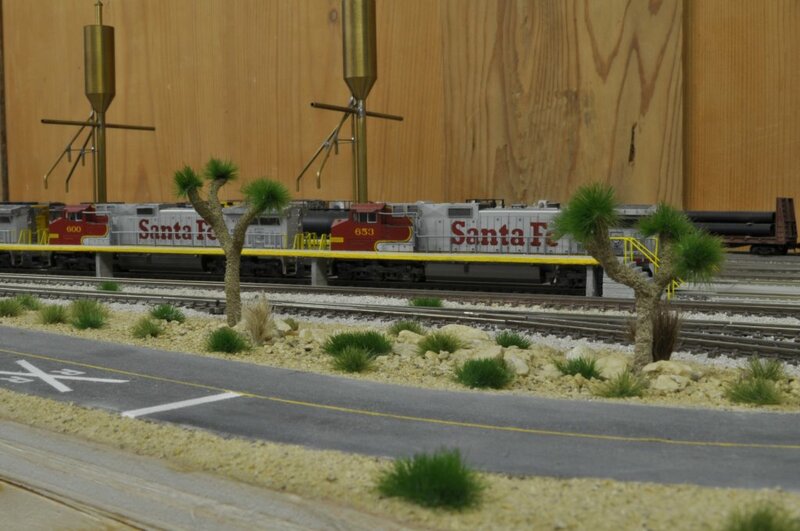 First, he studied the technology of Kim Nipkow, who built nice HO scale Joshuas. 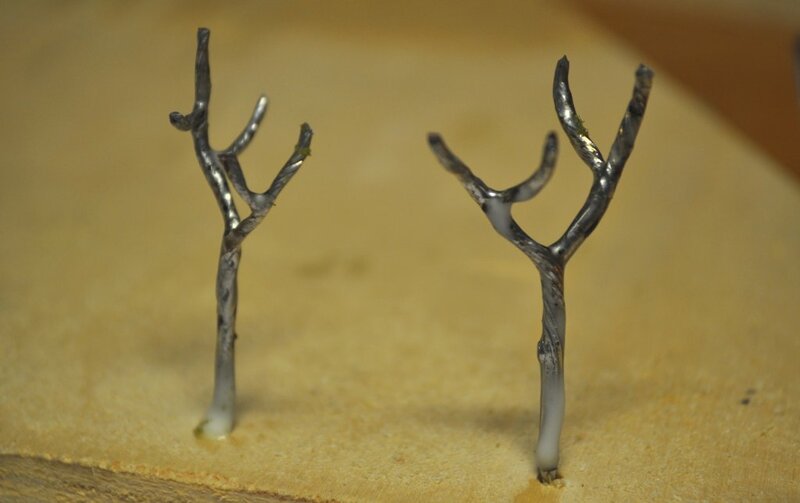 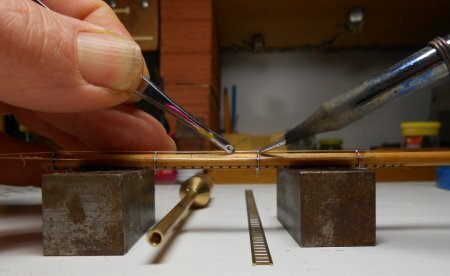 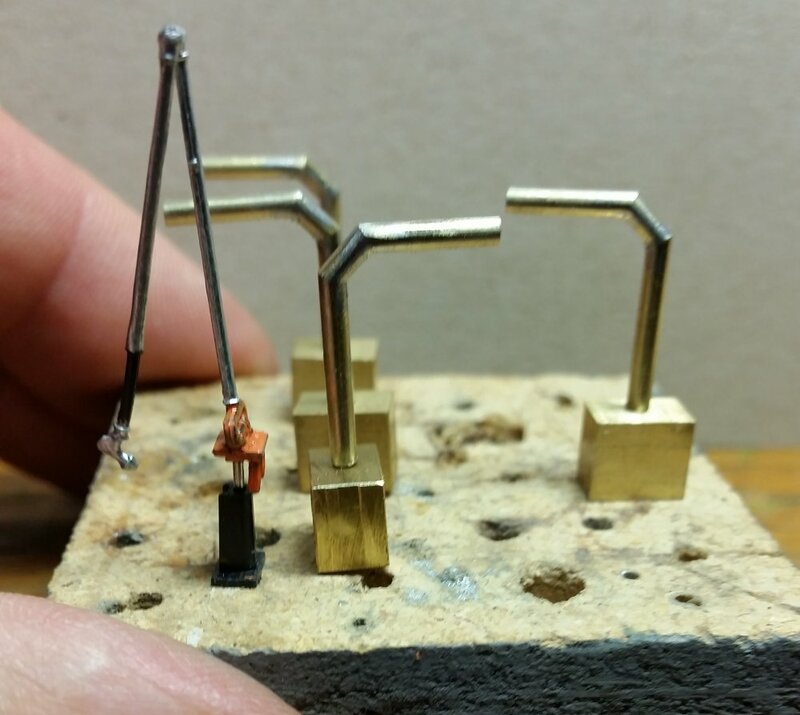 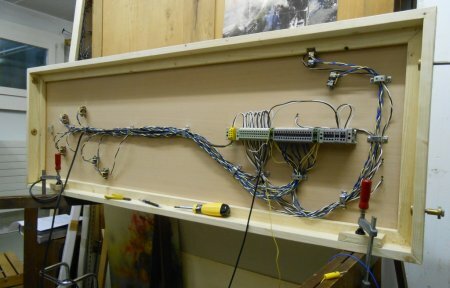 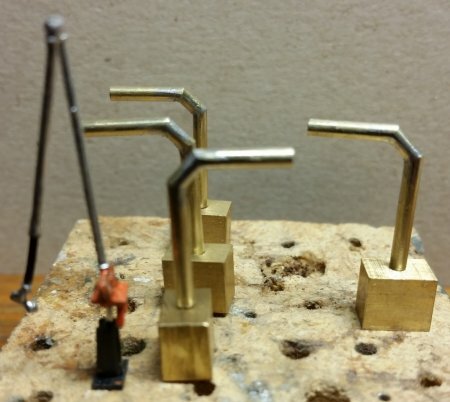 Start with copper wires, drill together, solder the wires and get the trunks. 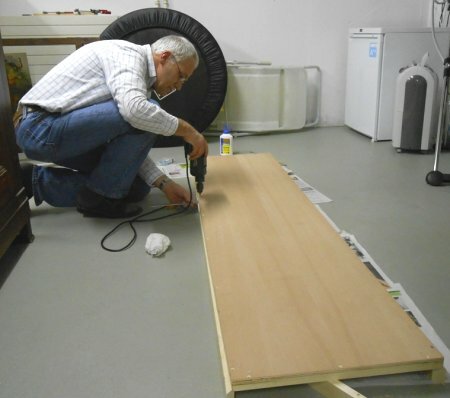 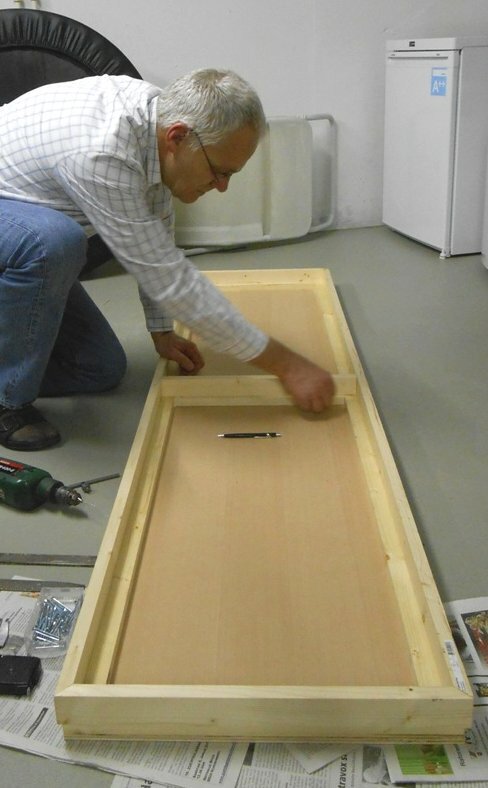 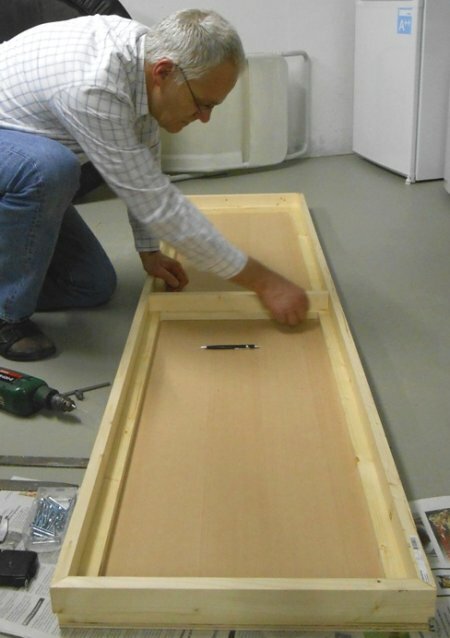 Afterwards, cover with white glue and add fine turf and fibers for the tips. 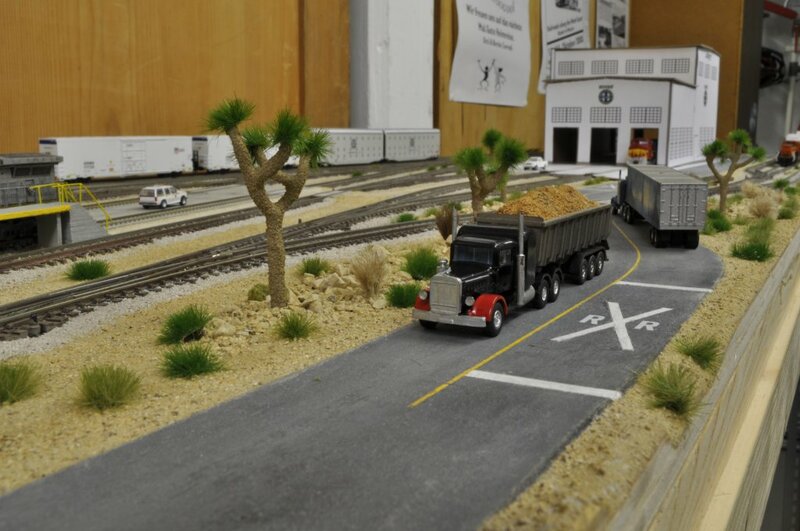 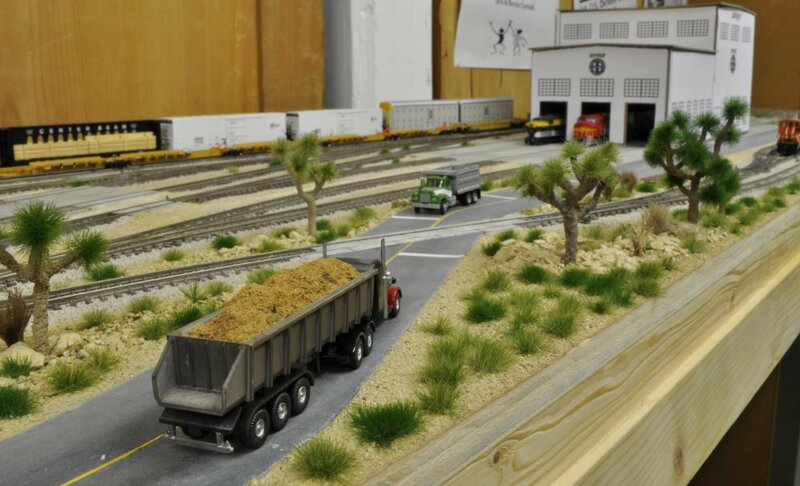 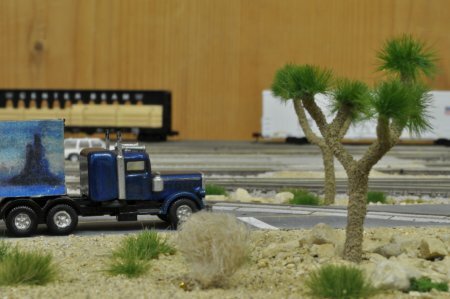 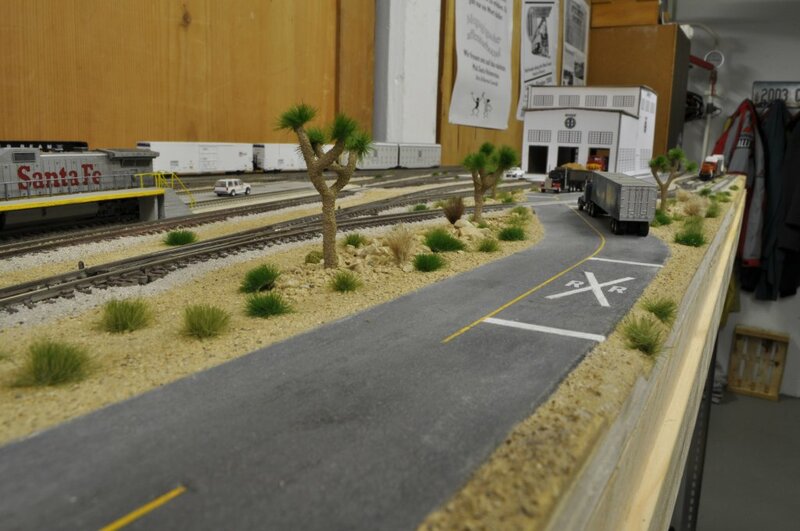 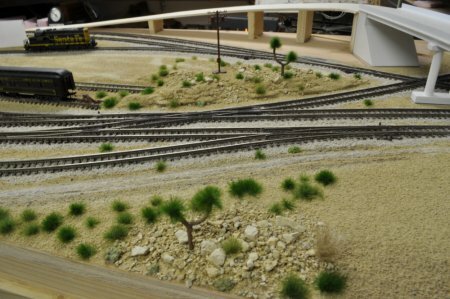 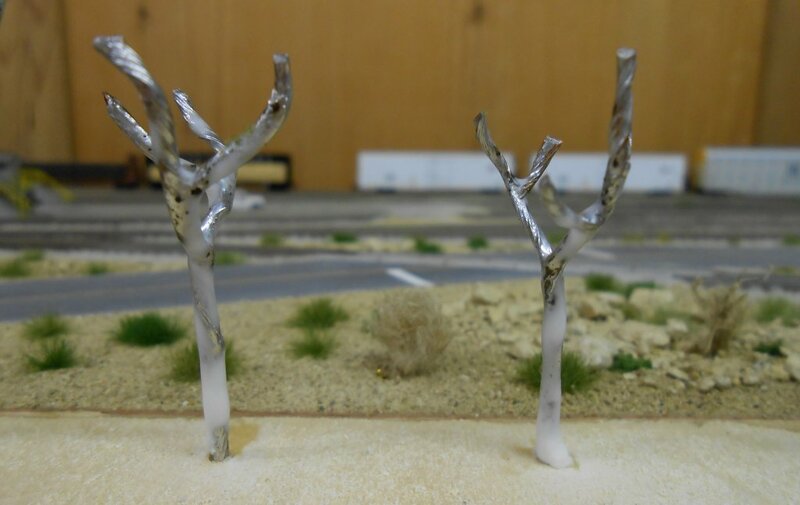 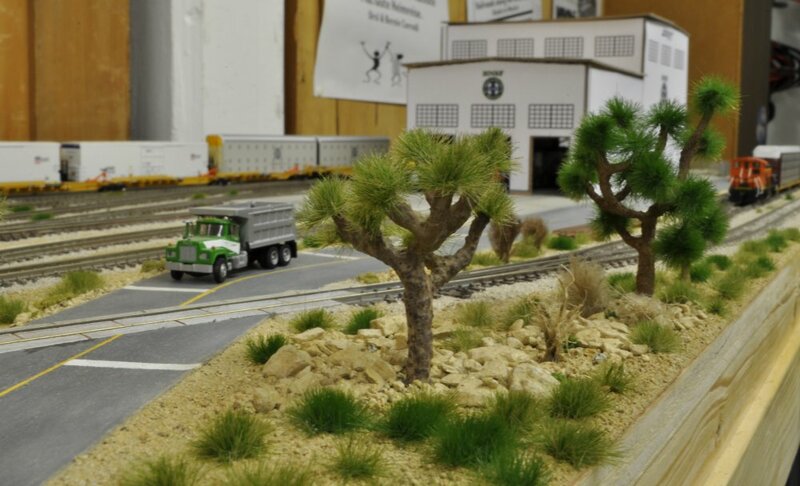 The first miniature Joshua Trees are planted on the modules and look great - Welcome to the Mojave Desert. 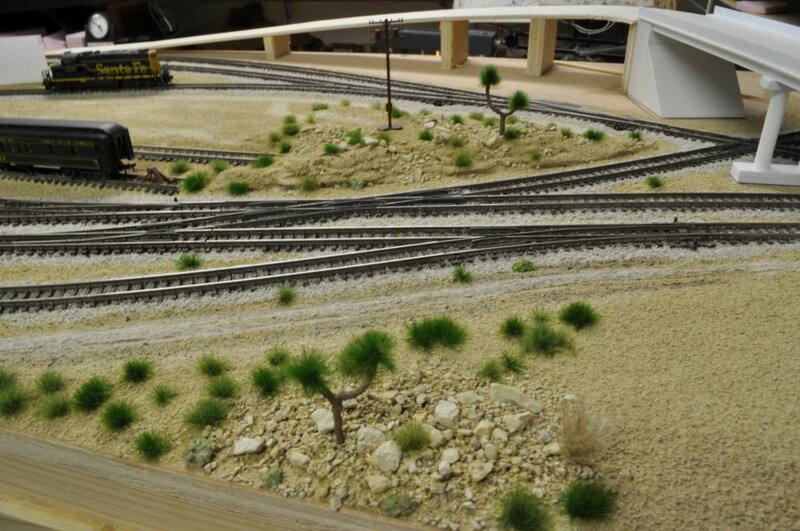 October 2014: New Joshua Trees and a fence have been added. 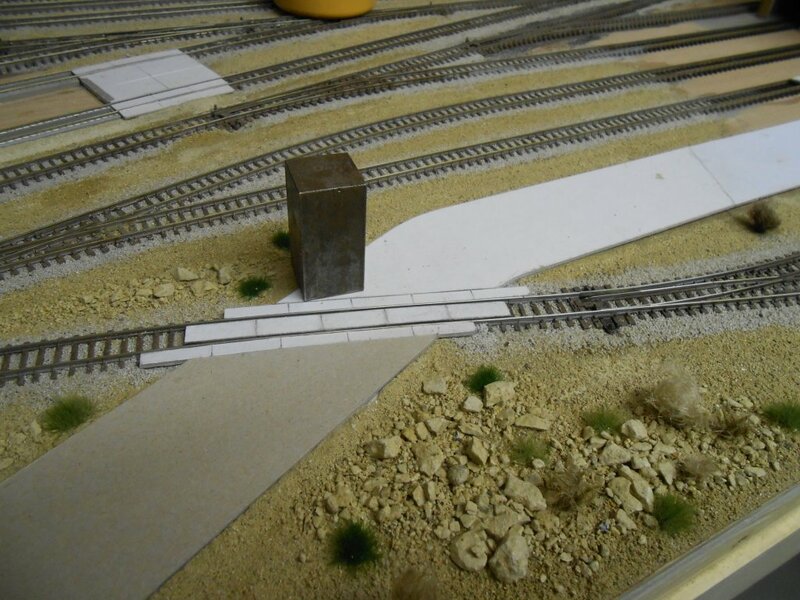 Now, the road needs railings on both sides. 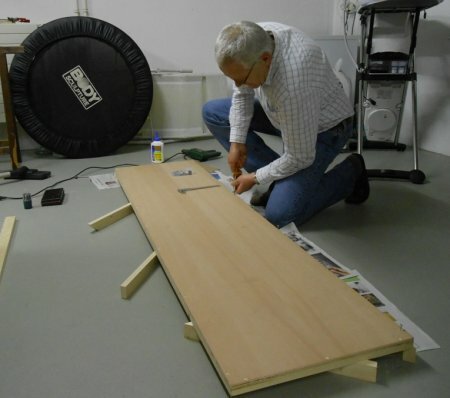 Even it is a lot of work but the result looks like the real thing. During one of my US trips, I did also visit Kansas City. 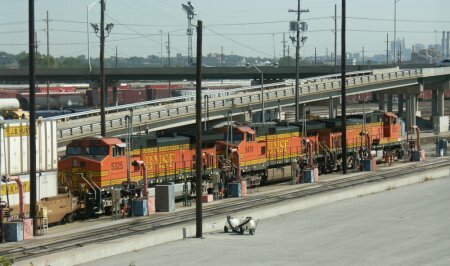 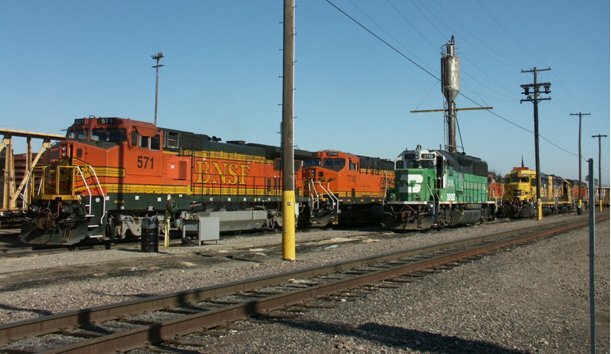 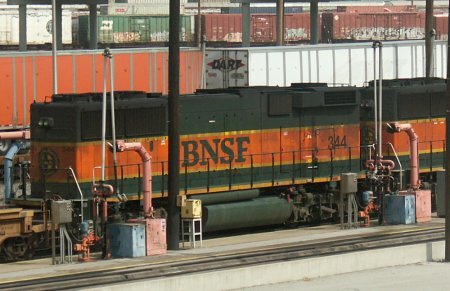 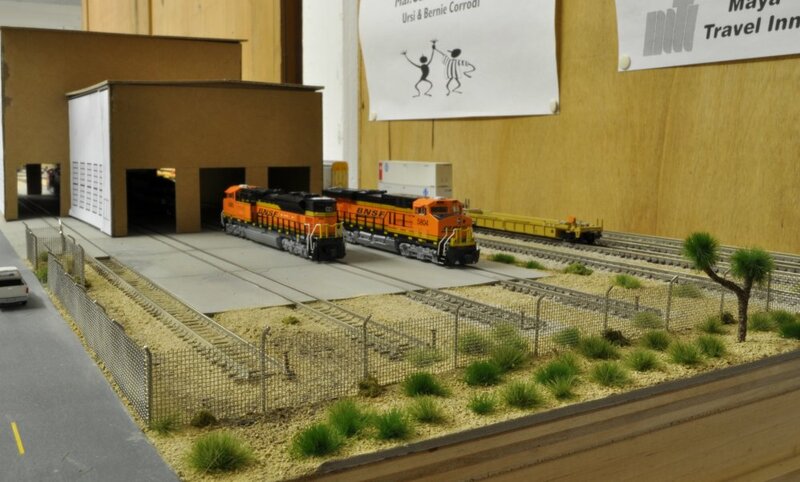 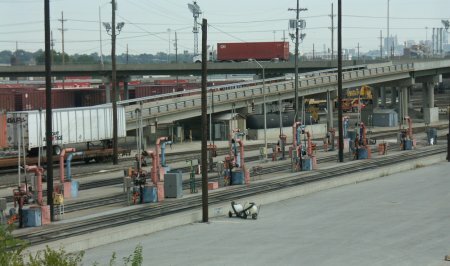 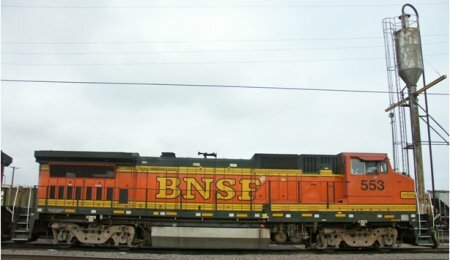 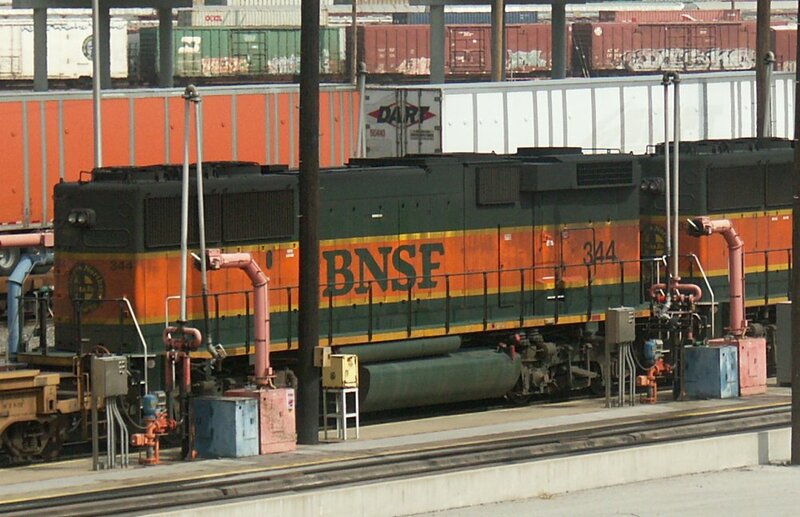 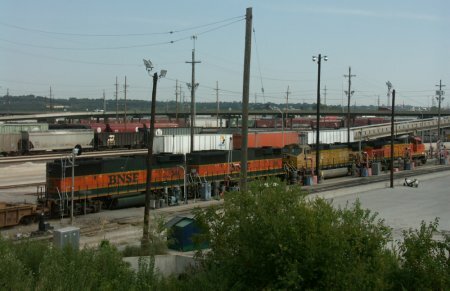 I went to the BNSF yard/facilities and took these 4 photos below. Does anyone know the exact use of these blue and red units? For the Mojave Terminal, Eugen made very realistic road signs incl. a BNSF shops sign. 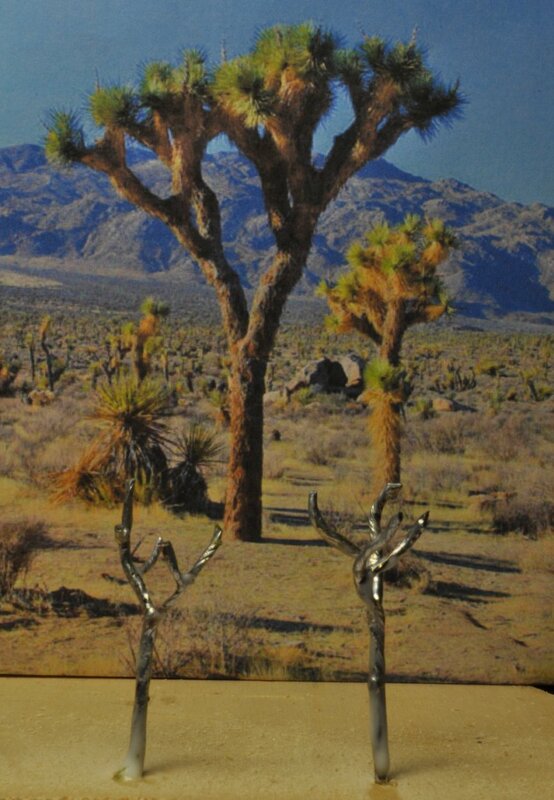 Eugen used some photos he made during his trips and printed on A3 paper. 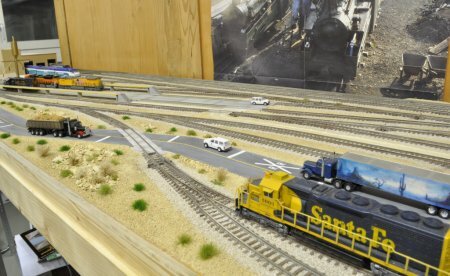 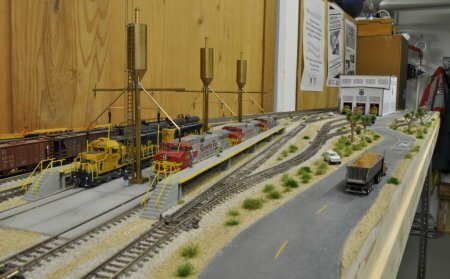 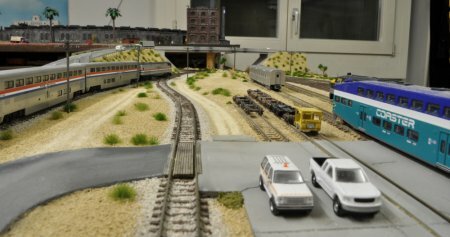 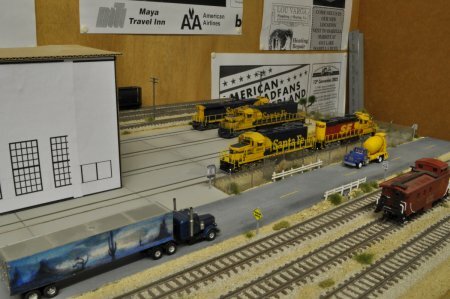 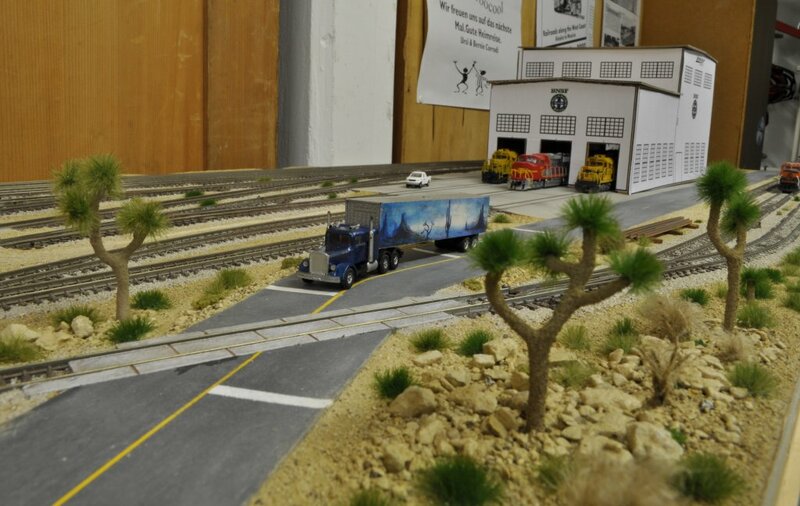 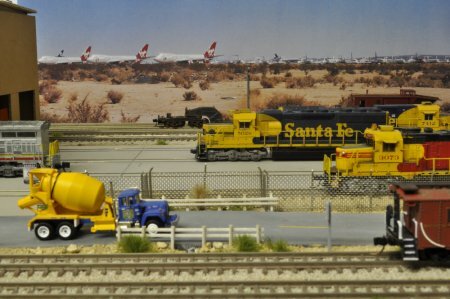 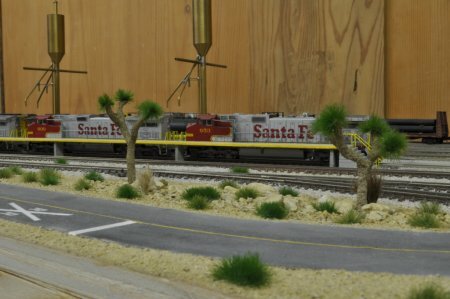 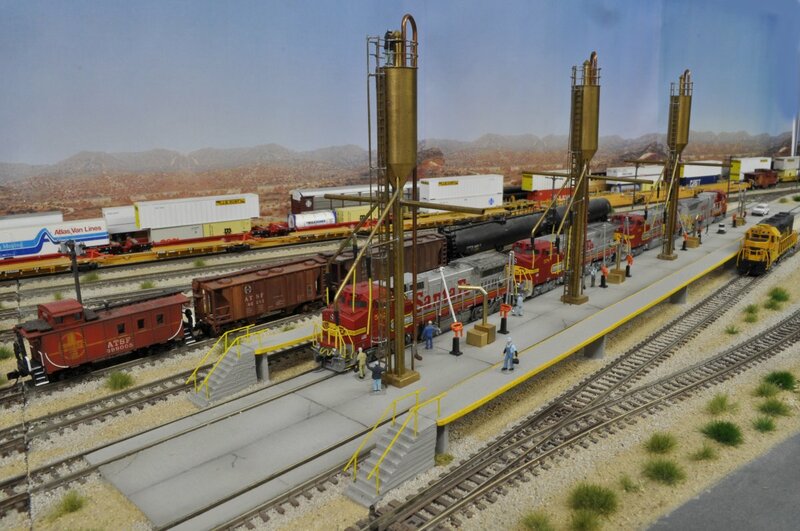 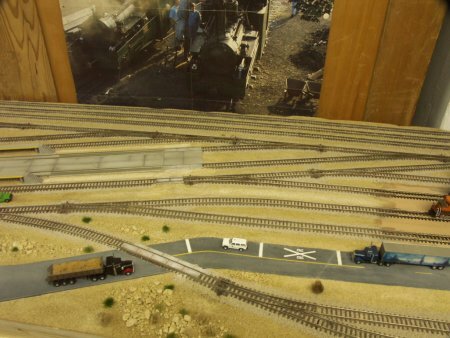 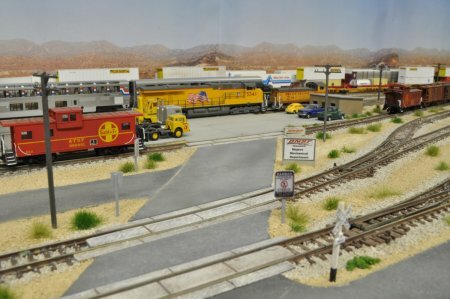 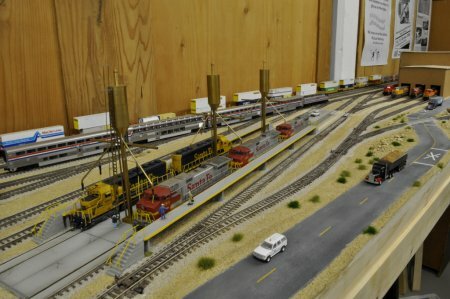 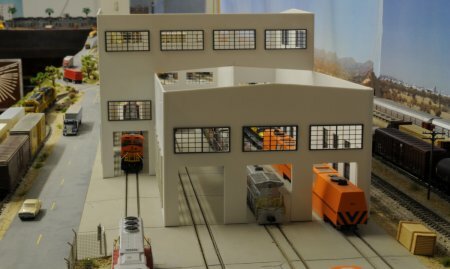 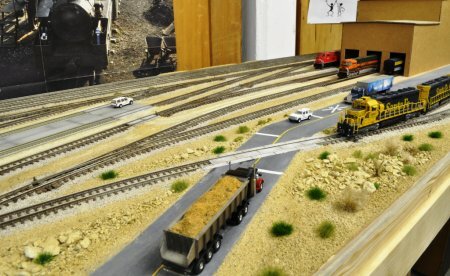 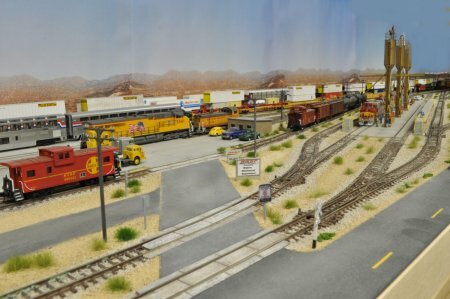 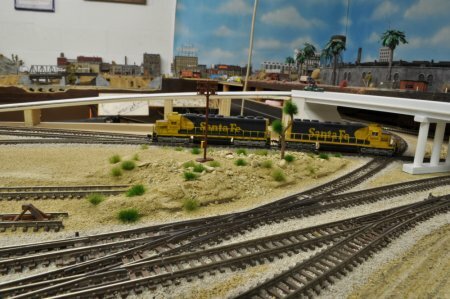 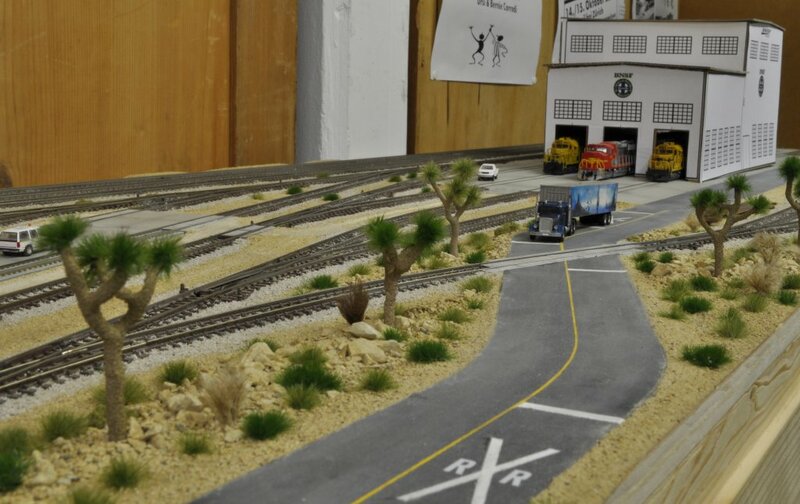 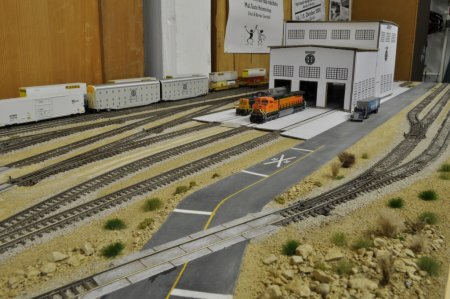 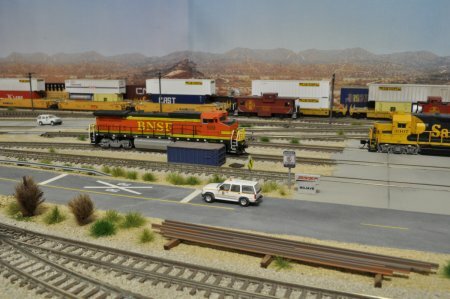 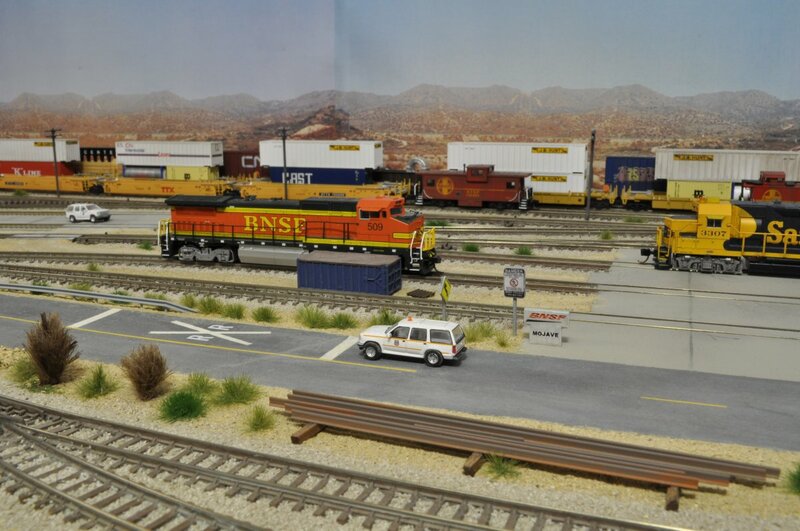 Films of the "Mojave Terminal" Layout which is an extension to the Old Part of LA. 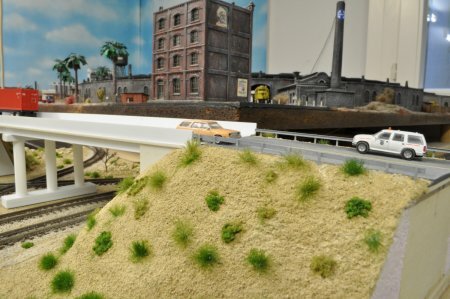 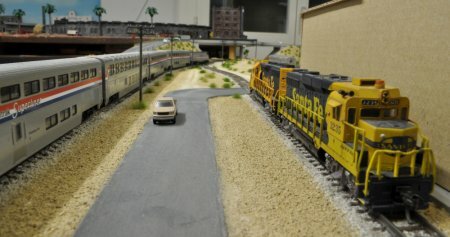 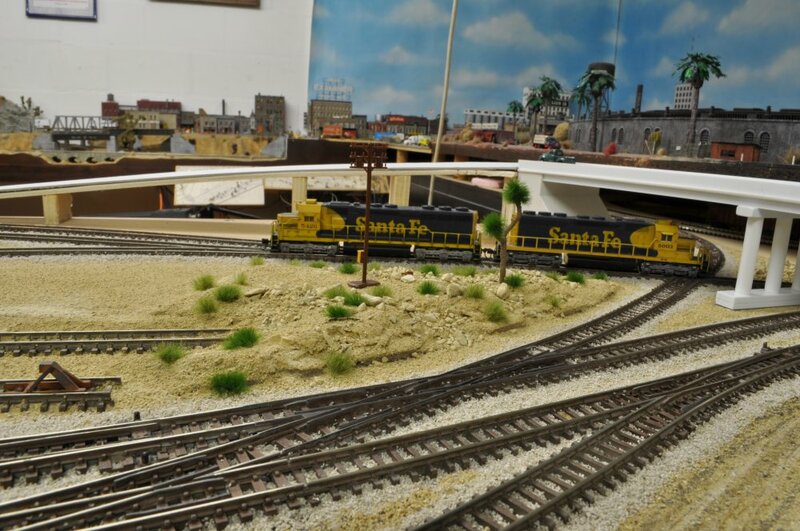 Films of the "Old Part of Los Angeles" Layout which is the original "old" layout before the Mojave Terminal was built.